A couple of weeks ago in the spring of 2017 I rode the “Train of Many Colors” in honor of the 7 train centennial, which was the recent subject of a 4-part FNY series. Last week, I wanted to take an opportunity to take the M train to Ridgewood, which will lose its MTA subway connection, the M train, for several months beginning in 2017, for repairs over the upcoming months in advance of the MTA closure of another line, the L train, for tunnel repairs to fix the damage caused by Hurricane Sandy in 2012; the L closure will take place beginning in 2019 and last approximately 15 months. 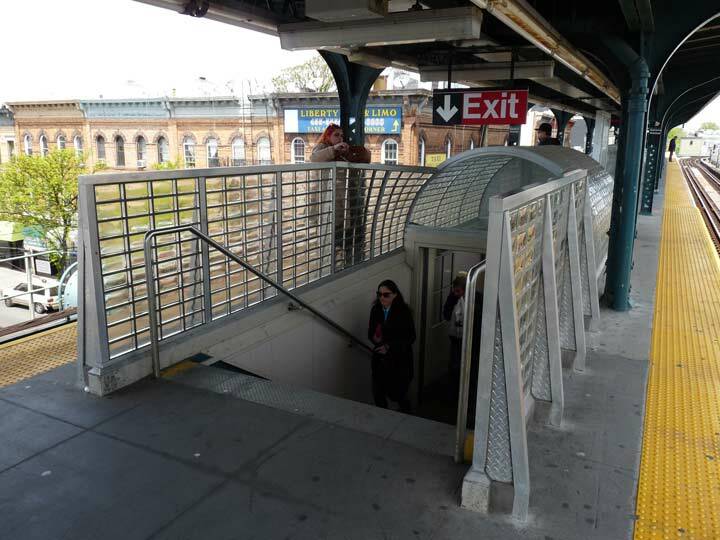 Since the M train will get an influx of service, it was thought prudent to make the line better able to accept extra trains. … as well as the curved viaduct that carries the M train Ridgewood Line from the Broadway el tracks to the Myrtle Avenue tracks. The station closures are a little complicated, but all the Ridgewood Line stations will closed while the LIRR bridge is replaced, while two will be closed during the viaduct replacement. Shuttle buses will attempt to take up the slack. 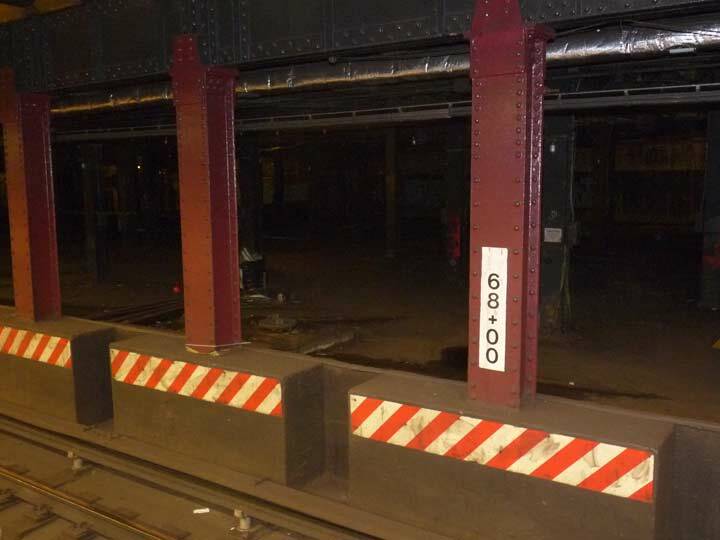 Already the Ridgewood Line is closed most weekends in the spring of 2017 while preparatory work is done for the closures. 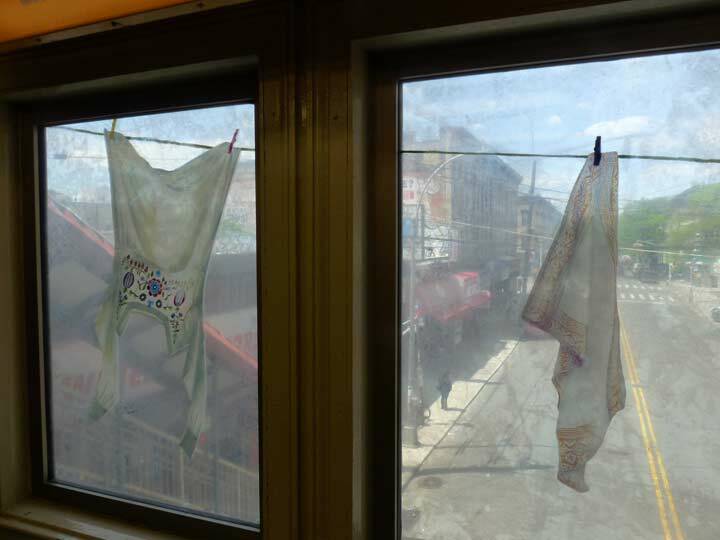 I mentioned that I had taken the “Train of Many Colors” on the centennial excursion. 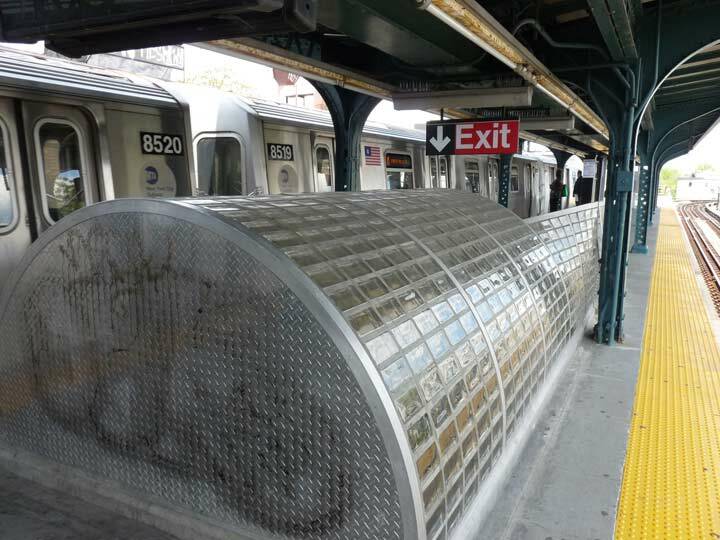 The M train itself has been a “line of many colors” as it has had three differently colored ID bullets during its existence! 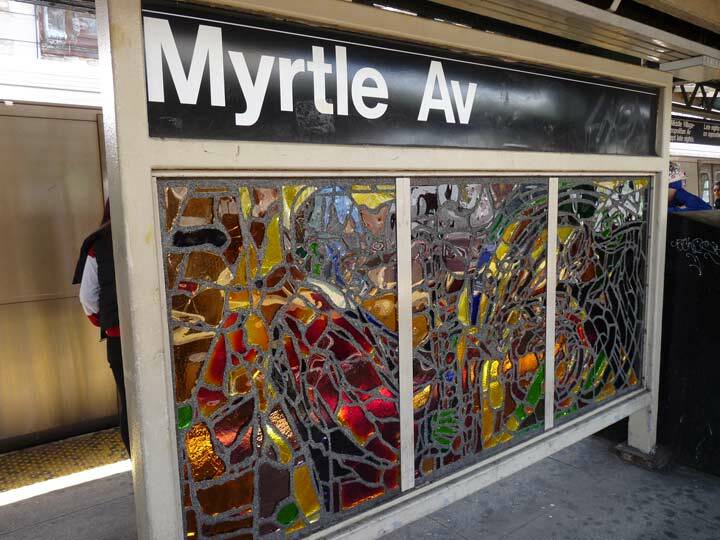 BMT lines used to be numbered (as the IRT still is) between 1924 and 1967; today’s M line was the Myrtle Avenue El, running from downtown Brooklyn to Metropolitan Avenue and was designated #10. Briefly between 1967 and 1969, the Myrtle El was designated the MJ and had a mauve-colored bullet, but the ancient equipment did not have roll signs and hence, the MJ bullet never appeared on actual trains. Between 1967 and 1979 the M bullet was light blue. 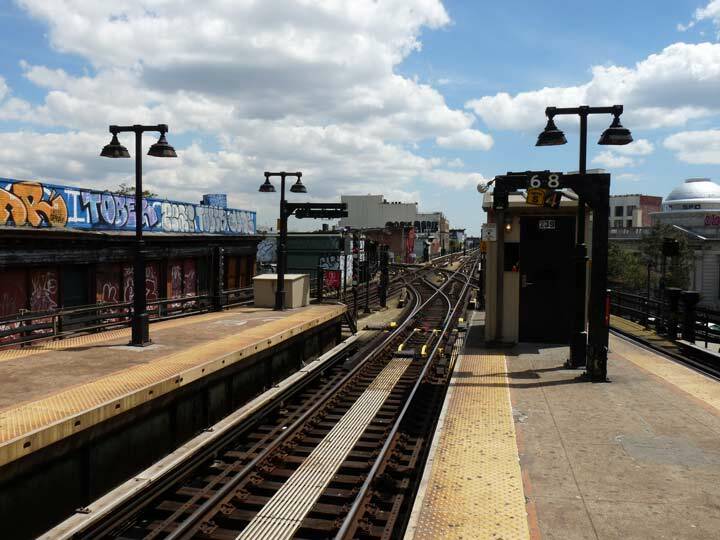 Until 2010, the M train used the Montague Street connection to accompany the R and N trains on 4th Avenue to 36th Street, where it connected with the West End Line, at that time the B train (this gets confusing after awhile). In 1979, station bullets all had their colors changed with colors now conforming to Manhattan trunk lines. For example the 7th Avenue IRT was red, the Broadway BMT lines yellow, Sixth Avenue IND lines orange, and so on. 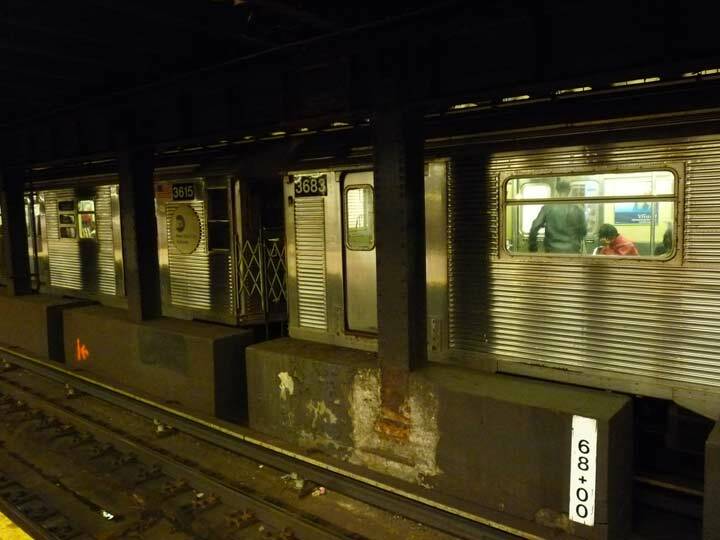 The Manhattan trunk for the J and M trains is a brief spin up Nassau Street and those lines got their own color: brown. 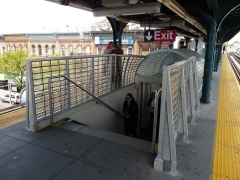 Finally, in 2010 M trains were rerouted from Queens to Queens: From Continental Avenue on the Queens Boulevard and 6th Avenue lines, using the Chrystie Street connector to the Nassau Street line and on to Metropolitan Avenue using the Brooklyn Broadway el and Ridgewood Line. At the same time, the M bullet gained its third color: orange for the 6th Avenue Line. Today only the J and its rush hour skip stop pal, the Z, are brown. All this color maneuvering has been rendered largely moot as the MTA is in the midst of abandoning its ID roll-sign bullet system as new subway cars beginning with the R-143s introduced in the early 2000s have electronic ID signs on the front of the trains (refurbished R-32 trains introduced the concept as early as the 1980s). Colored bullets will only be found in small versions on subway car route maps and online and printed system maps. I’ll miss them; you’d think the train car manufacturers could display differently colored LED lights for the signs if the MTA didn’t want to fuss with roll signs anymore. The colored bullet had a practical function: trains could be identified better when you were standing on the platform and looking down the tunnel. In fact the subways. prior to the colored bullet era, used to have a colored lantern system on the train fronts for that very purpose! This wikipedia page further explains all these changes. 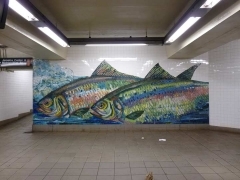 At the Roosevelt Avenue station in Elmhurst, the M train seemed delayed so I decided to expedite matter by taking the F train to Delancey Street and making a transfer to the M or J there. The station is full of artist Ming Fay‘s mosaic depictions of shad since at this point, we are fairly close to the East River (Fay’s depictions of the orchards that were formerly in the area, hence Orchard Street, are elsewhere in the station). 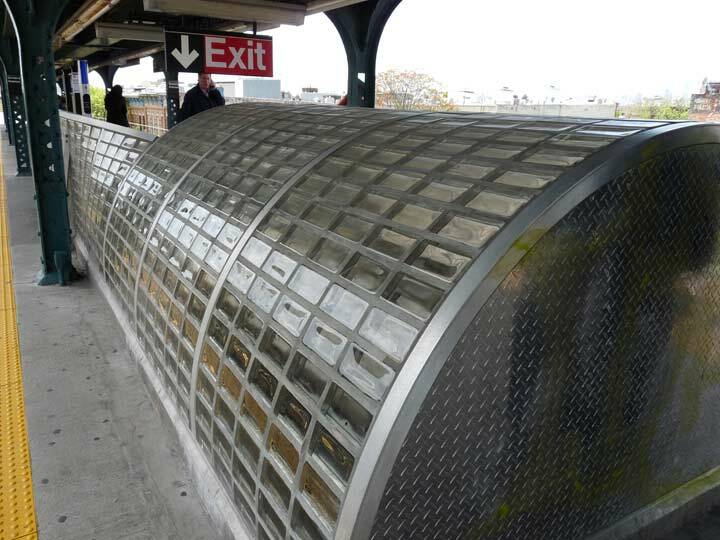 They were installed in 2004 during a station renovation. 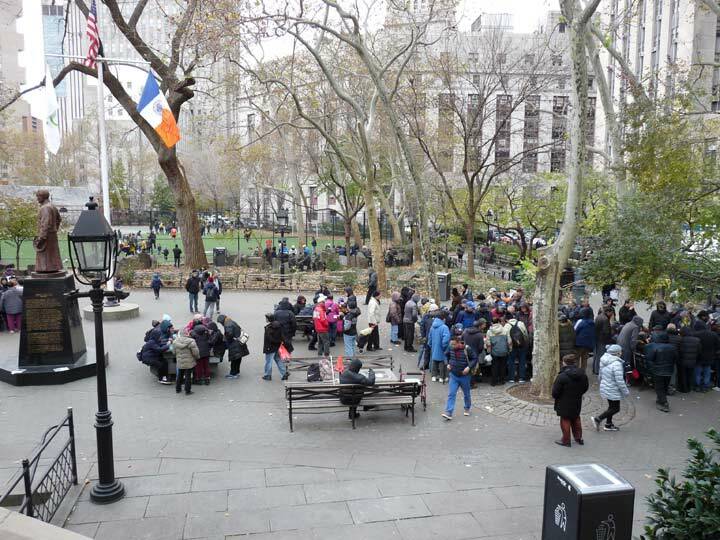 This is the only F/J transfer in the system; the F and M are both locals on the 6th Avenue Line. The Delancey Street station opened on January 1st, 1936. Most stations for the 6th Avenue IND opened in 1936 and above Broadway-Lafayette, 1940. The line was built to replace the 6th Avenue Elevated train, which ran on 6th Avenue up to West 53rd Street where it turned west to connect to the 9th Avenue El, from 1878 to 1938. Thus, 6th Avenue was bereft of subway or el service between 12/4/38 and 12/15/40 — not quite, though, as the Hudson Tubes, now the PATH train, continued to run under 6th Avenue during that time; the 6th Avenue IND was built around it. Delancey Street uses the Machine Age-inspired large name tablets that featured in all IND stations constructed beginning in 1925. Usually, in IND, the small black and white station identifiers are in an extended font resembling Copperplate (but not quite). 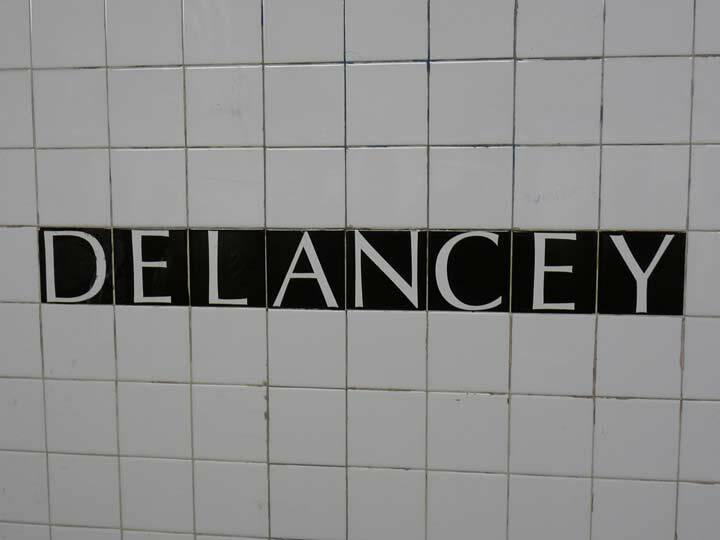 In 2004, when the Delancey station was redone, they were reinstalled with the sanserif Optima font. 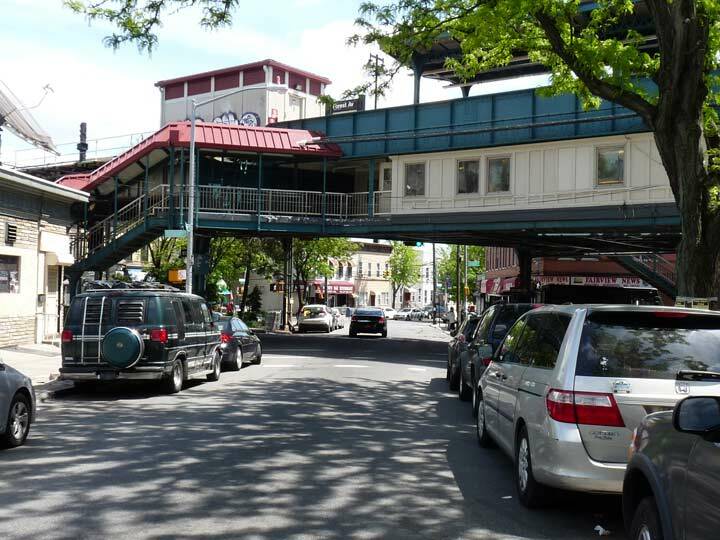 The Nassau-Jamaica has always been slightly mysterious to me because it’s the line with which I have the least experience, having lived in Bay Ridge and Eastern Queens. 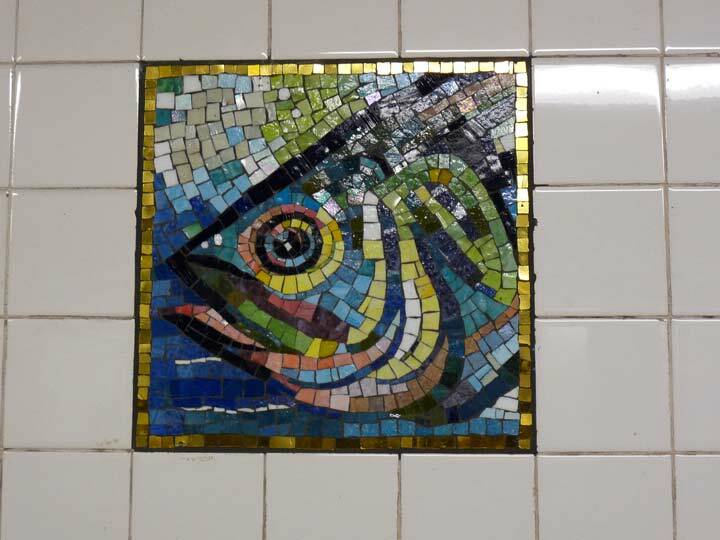 For example I am aware that these Essex Street ID tablet mosaics are not the originals and were installed just a couple of decades ago to replicate classic mosaic BMT signage. 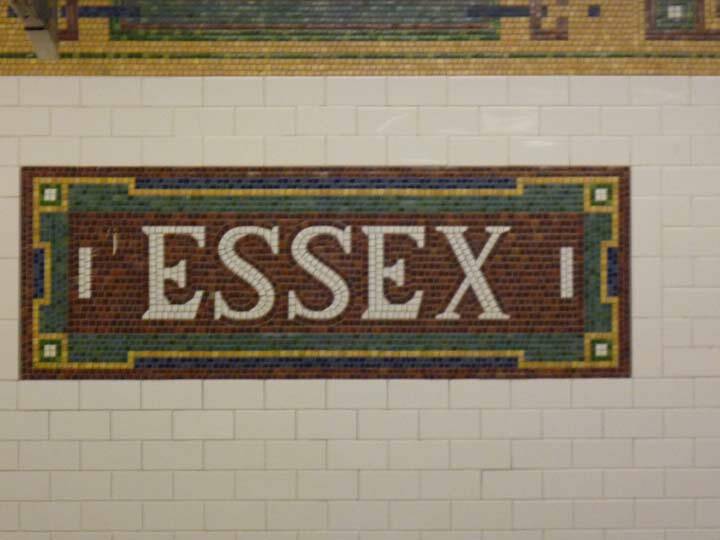 Essex Street is the oldest of the Nassau-Jamaica Line stations, opening in 1908; stations south of here going down to Broad Street were opened in 1913 and as late as 1934. 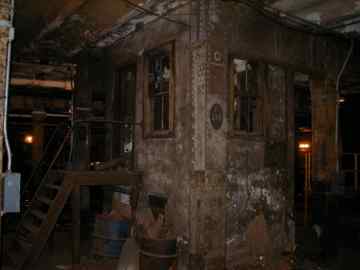 The Bowery and Chambers Street stations are really showing their age, and the condition of the abandoned platform at Chambers is one of the MTA’s great shames. I remember taking the M out to Middle Village with a girlfriend in 1982 to a party at the home of a friend, Jack Killcommons, who tragically passed away a short time later. In 1982 the MTA was at its nadir. We got a couple of trains, one of which had the old blue M bullet on the rollsign; another had the letter taped in the railfan window! Needless to say both trains were suffused with graffiti. Here’s a photo exhibit recalling that era. The J is currently my favorite line in the system because it continues to use superannuated equipment like the R-32, pictured here, and there are still a few R-42s in use. 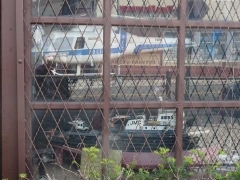 All this will change soon as the latest MTA subway car purchase will soon retire these war horses. One of the oddest aspects of the Essex Street station is the presence of a trolley turnaround terminal. 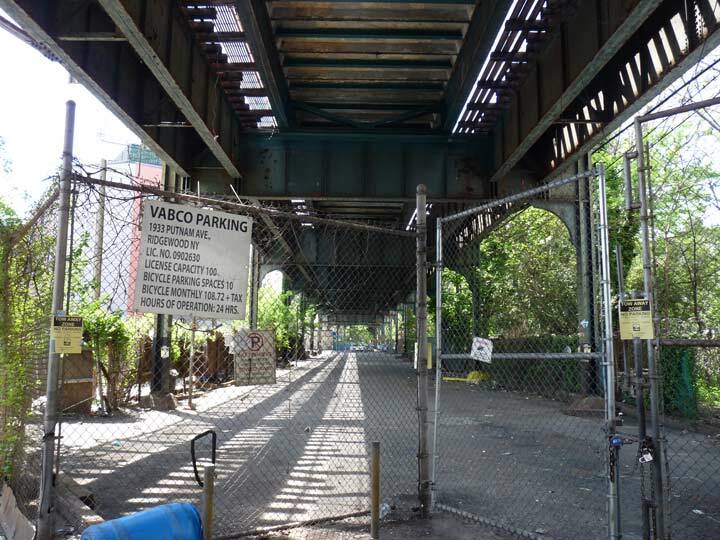 It served as a terminal for numerous trolley lines from Brooklyn that crossed the adjacent Williamsburg Bridge, making it one of a handful of underground trolley stations or terminals. The MTA has pretty much allowed it to remain as is for decades. 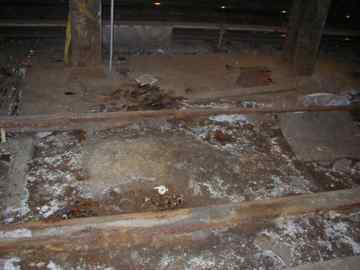 The tracks are still there as well as the overhead supports for the wires that gave power to the trolley cars. Service to the terminal ended in 1948. 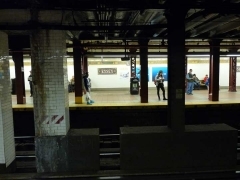 The “platform” can be glimpsed, though not very clearly, from the platform of the Essex Street station on the BMT J and M lines. A pair of binoculars may help to see the tracks from the platform. The MTA has produced a video that explores the space. 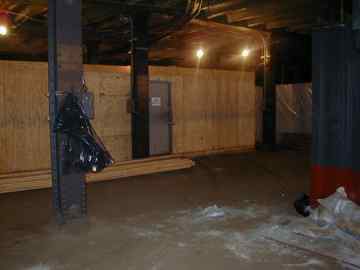 The massive Essex Crossing development is being built adjacent and above the terminal. The MTA is encouraging redevelopment of the trolley terminal and one plan, called the Low Line, wants to turn it into a sort of underground version of High Line Park by 2021, though who knows what will happen, if anything. Tired of waiting for Ms at Essex, I got a J instead (disappointingly one of the newer cars) and took it to Myrtle Avenue, my last chance to transfer to an M; the Ridgewood Line branches east from here and runs along Myrtle Avenue, Palmetto Street, and in an unusual situation in NYC, its own right of way to Metropolitan Avenue. In another unique situation in NYC this is the only remaining elevated train crossover in NYC. Eastbound M trains have to cross the northbound J train tracks. Various proposals have been made to clear up the situation but it’s likely the crossover will remain in place. 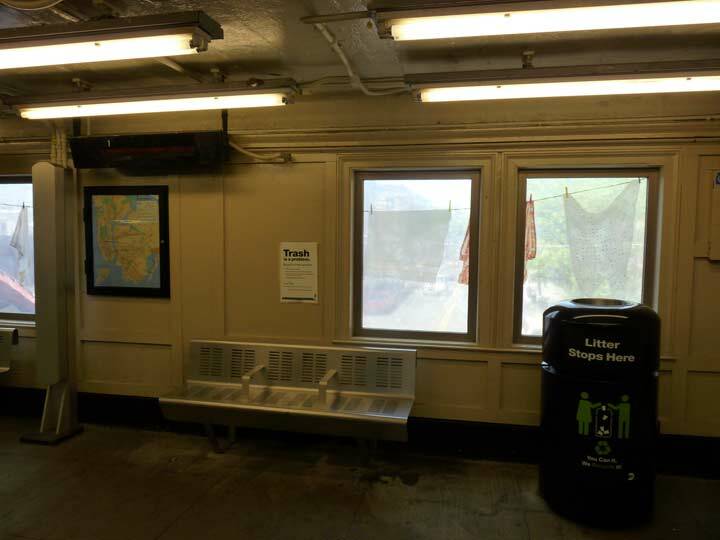 From the platform, you can see a disused portion of the Myrtle Avenue el, which operated between 1888 and 1969 from here to downtown Brooklyn; before the 1940s, it had a connection to the Brooklyn Bridge. 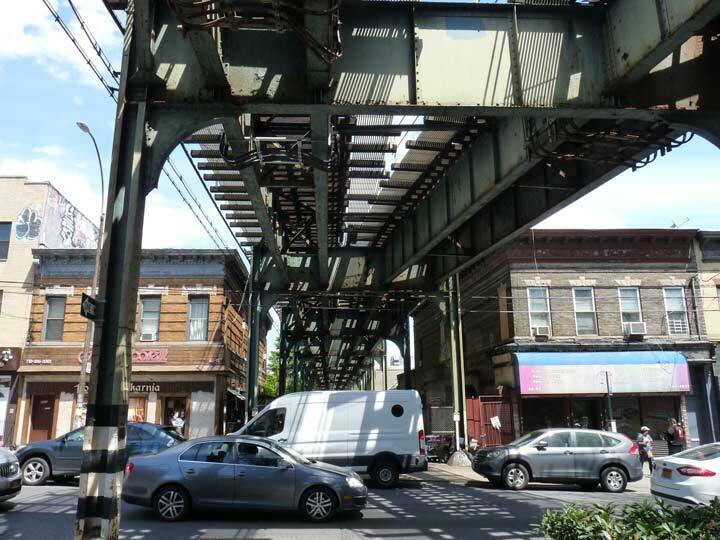 It was considered necessary to retain the superstructure as far west as Lewis Avenue to maintain the overall architectural stability of this elevated crossover at Broadway and Myrtle. Here’s a photo showing both levels in use. 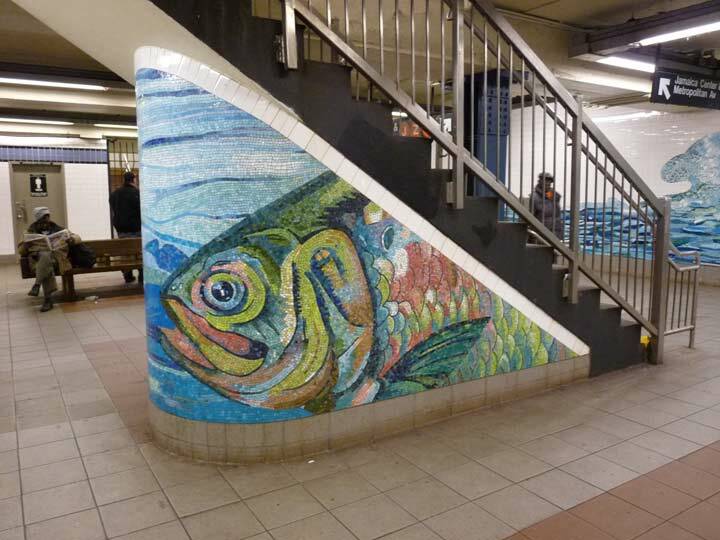 Colorful mosaics, Verna Hart’s “Jammin’ Under the El,” were installed on the platform during station renovations in 1999. 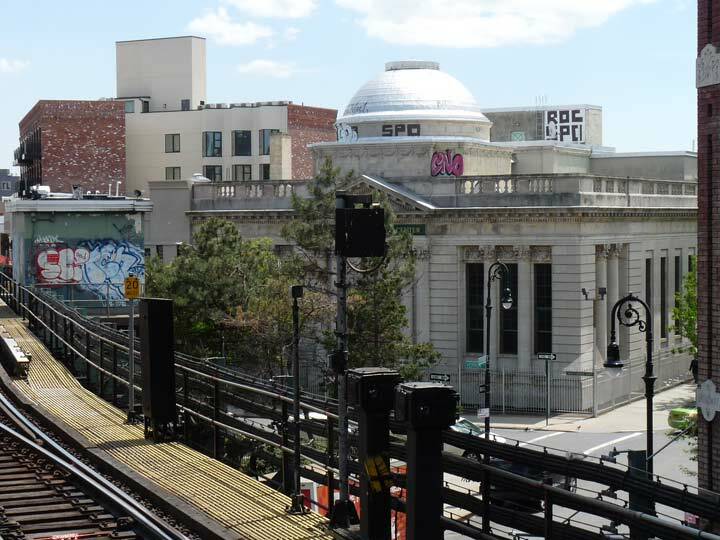 Just as the big dome of the former Williamsburg Savings Bank can be seen from the north end of the Marcy Avenue platform, here we see the former Prudential Savings Bank at Stuyvesant and Vernon Avenues from the south end of the Myrtle Avenue station. 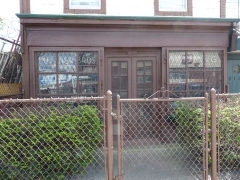 It was founded by a group of local German-American businessmen in 1908 and constructed by a German firm, Daus & Otto. In 1908 German immigrant influence was at its height and German-American entrepreneurs ran over a dozen large breweries in the area. Some of their names are still recognizable: Schaefer, Rheingold. I got off at the Seneca Avenue stop. There’s a bit of mystery about the name of the avenue because up until the early 20th Century, it was instead called Covert Avenue. 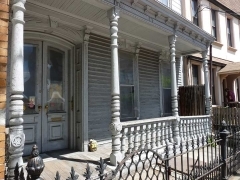 The Coverts were a Dutch settler family in the colonial era, and their farmhouse survived on Flushing Avenue until the early 1900s along with similar Dutch colonial farmhouses, the only survivor of which is the Van der Ende-Onderdonk House. The plot thickens! An upstate NY town called Covert is in Seneca County, named for a Native American nation in the pre-colonial Iroquois League. 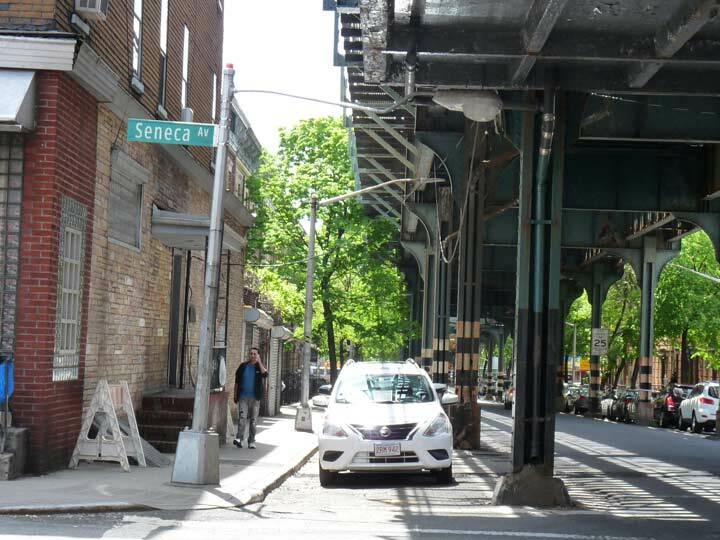 My guess is that Covert Avenue was changed to Seneca Avenue because there is already a Covert Street relatively nearby in Bushwick, running between Broadway and Wyckoff Avenue near the Halsey Street L train station. NYC decided to apply the county name to the street; there were also Coverts who settled upstate. Though the Covert farmhouse was torn down decades ago, it’s amply represented in photos on the Library of Congress and Getty Images websites! 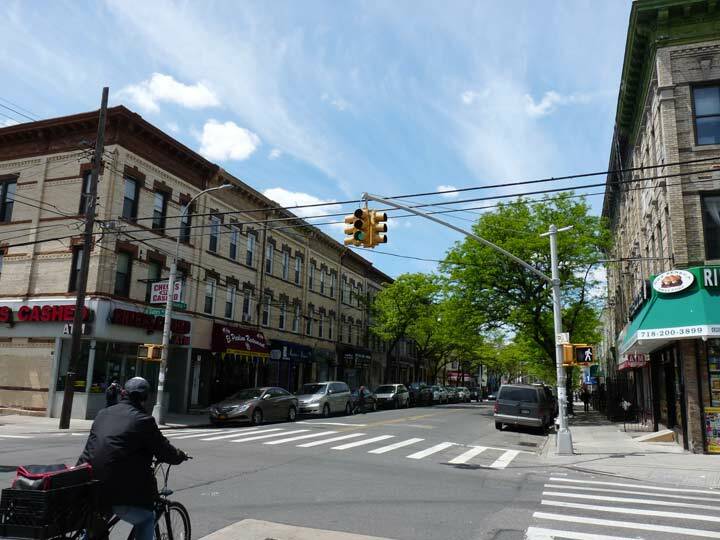 I decided to begin my Ridgewood walk here at Seneca Avenue so I could start out with this extraordinary northwest view on Seneca Avenue toward the King of All Buildings, which is ever so slightly off center. 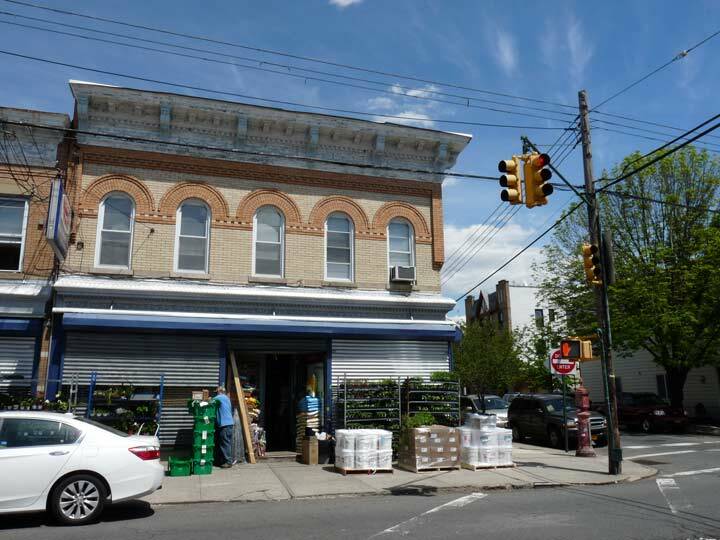 Ridgewood’s typical yellow-brick housing stock (some blocks of it have received NYC Landmark status) can be seen on either side. 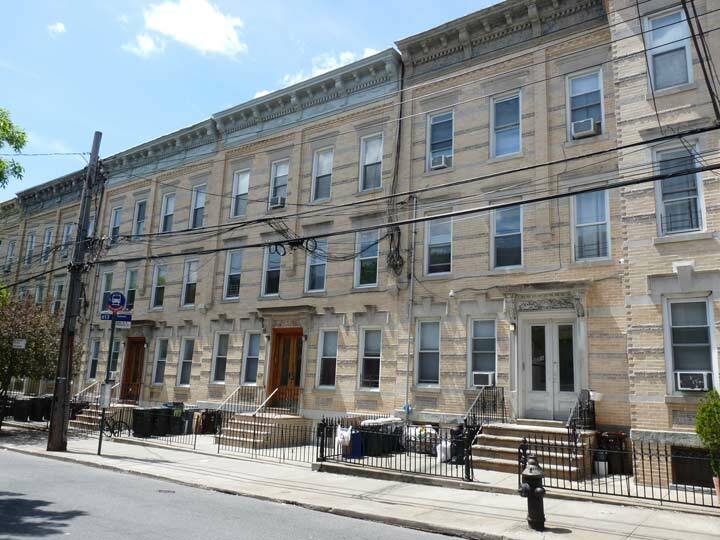 Much of Ridgewood’s dwellings were built by developers Paul Stier and Louis Berger in the early 20th Century. 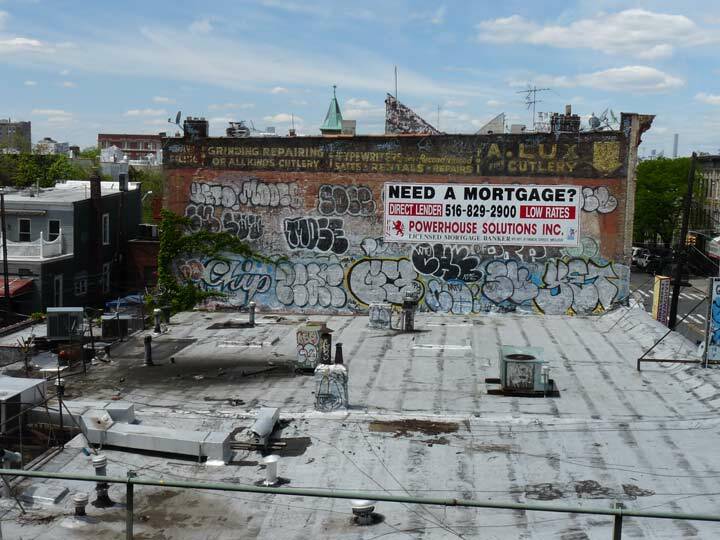 I also wanted to check out the state of a painted mural that can be seen from the platform. 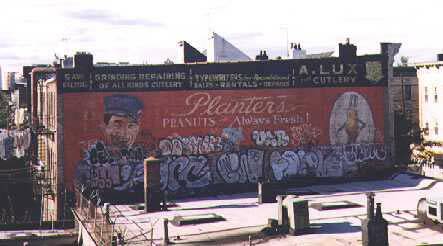 In 1999 I got this shot from the platform — it looks like an ancient ad for Planters’ Peanuts complete with your friendly nut man and Mr. Peanut. This set of ads was painted in the mid-1980s for the feature film Brighton Beach Memoirs. They were cleverly rendered to match the prevailing painted ad stylings of the period when the movie was set in the 1920s. Dominating the center was a simulacrum Planters Peanuts ad featuring a smiling peanut vendor and in the oval on the right, Mister Peanut, as he appeared in the 1920s or 1930s. These days, a vinyl ad covers up whatever remains of the peanut ad, but even before that, the local youth had had their way with it. All is not relatively new! I was recently told that the string of ads for A. Lux Cutlery were the real McCoys, as the shop was located in the building just below the ad. 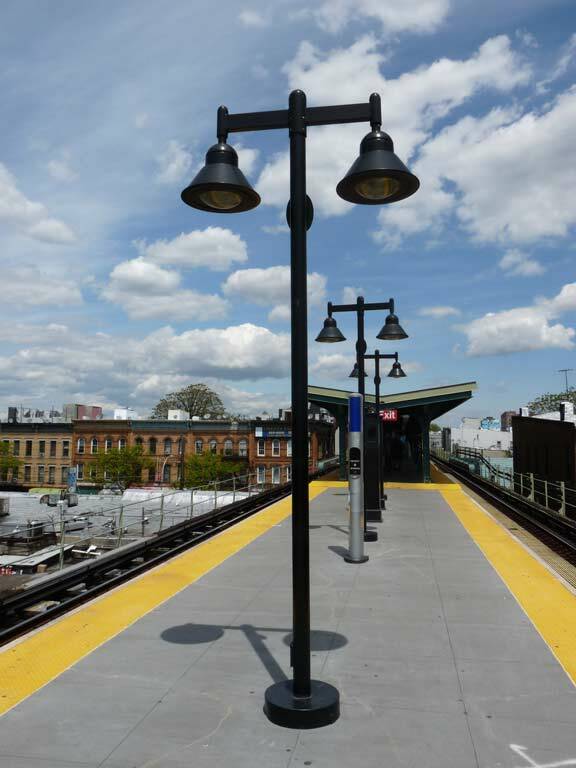 Platform lamps at Seneca Avenue have a contemporary design that harks back to 1910s lighting. (other stations make more faithful copies). Station renovations at Seneca Avenue in 2013 placed pod-like glass canopies over the exit/entrance staircases that resemble the receptacles that astronauts sleep in while in suspended animation while their spacecrafts take decades to reach their destinations, like in Planet of the Apes, Alien or even Star Trek. Inevitably something goes wrong and the computer kills several status-ing humans, or a monster gets loose on the ship, or the awakened humans turn out to be a superrace. I doubt any of the above will happen here. When I got to the Seneca Avenue foyer, I noticed something else going on. 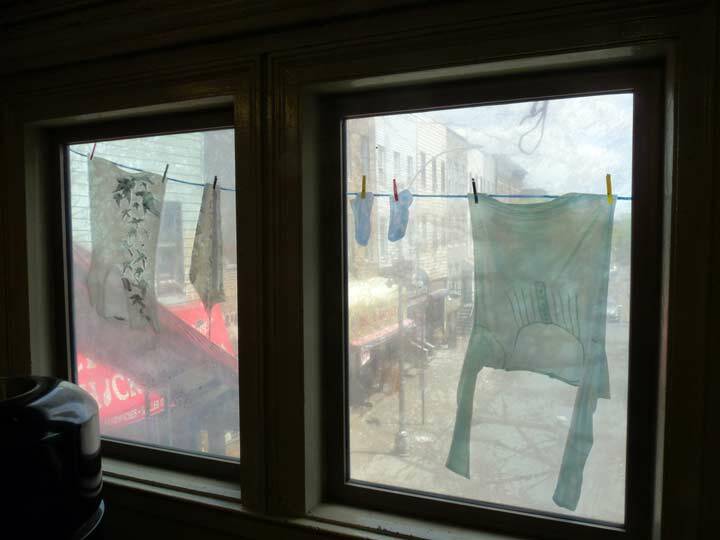 It appeared that someone’s dirty wash had been hung outside the windows, with clothesline, clothespins, the whole deal. Than it dawned on me that this was station art. It’s by Laura F. Gibellini, installed in 2014, and called “Dom (Variations)“. 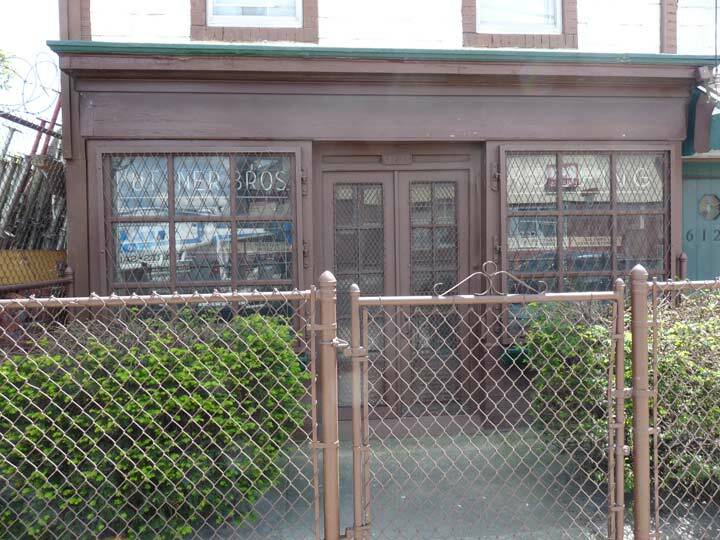 Real estate office, Seneca and Palmetto, under the station exit. 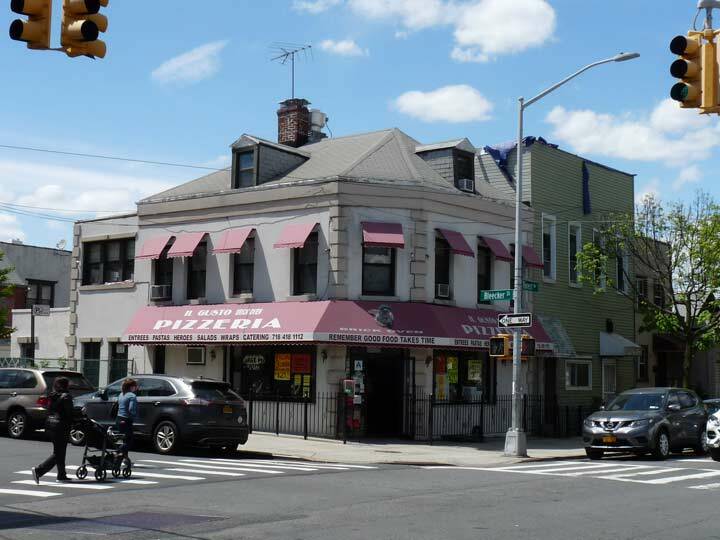 When bicycling through Ridgewood in the 1980s I would always gravitate to the corner of Seneca and Palmetto Street. Why? 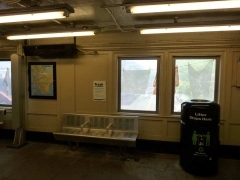 There are two catercorner lampposts, with S-curved masts to get them around the Seneca Avenue el station’s fare control walkway, that kept their Westinghouse AK-10 cuplight luminaires decades after they had been replaced everywhere else. They finally succumbed to modernity in the late 1980s or early 1990s, but still await LED lamps. Seneca and Gates Avenues. Architecture in the neighborhood is relatively consistent, with 3 story brick walkups in buff or yellow. There must be a story behind this “housewares” store’s name — it seems to be a grocery from the looks of things — on Gates off of Woodward. If you know, hit me in Comments. 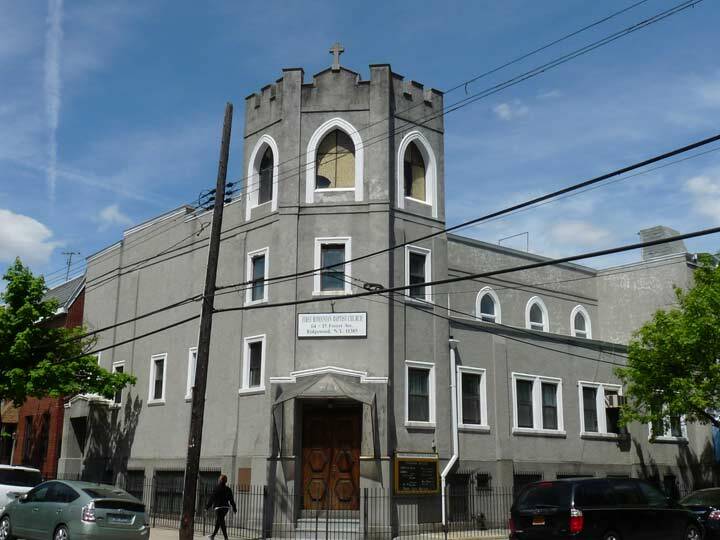 Ridgewood Seventh-Day Adventist Church, Gates between Woodward and Fairview, an edifice completed in 1919. 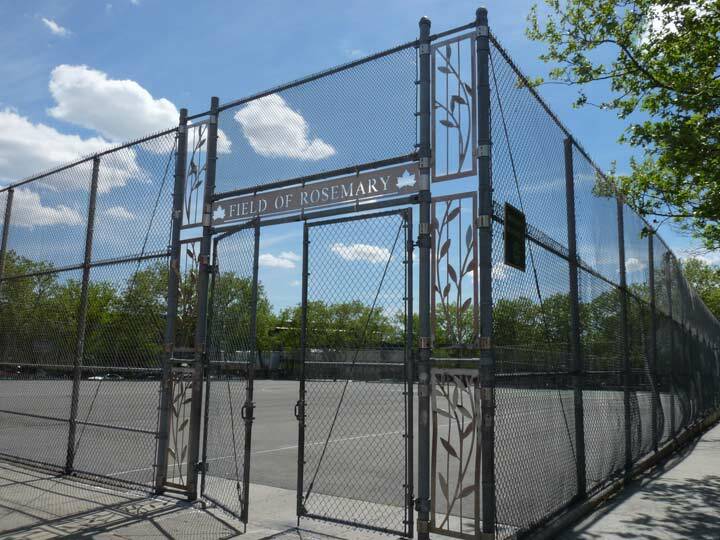 At Fairview Avenue (there is also a Grandview Avenue, so I suppose the view wasn’t quite as good on Fairview) I entered the compact Ridgewood North Historic District, bordered by Fairview, Woodbine, Forest Avenue, Grandview and Gates, with a smidge of Linden Street. Mathews’ associate, Louis Allmendinger, was the architect. 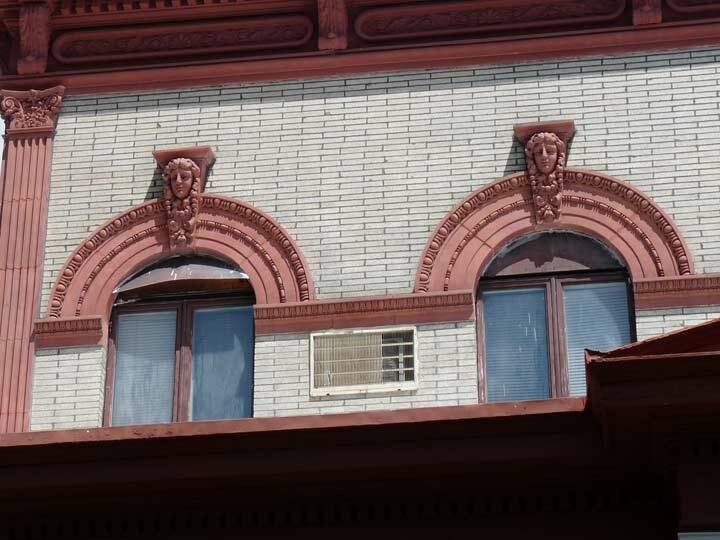 The buildings were constructed with bricks from the kilns of the Kreischers in Staten Island. “New law” tenements were designed with more space and better sanitation than ever before, with generous lot sizes, introducing wide air shafts to provide improved air and light quality, including bathrooms in each unit. Part of the Ridgewood North historic district at Gates and Grandview Avenues. The Forest Pork Store, Forest Avenue at Woodbine Street, has a terrific handmade sign, but has been closed for several years. 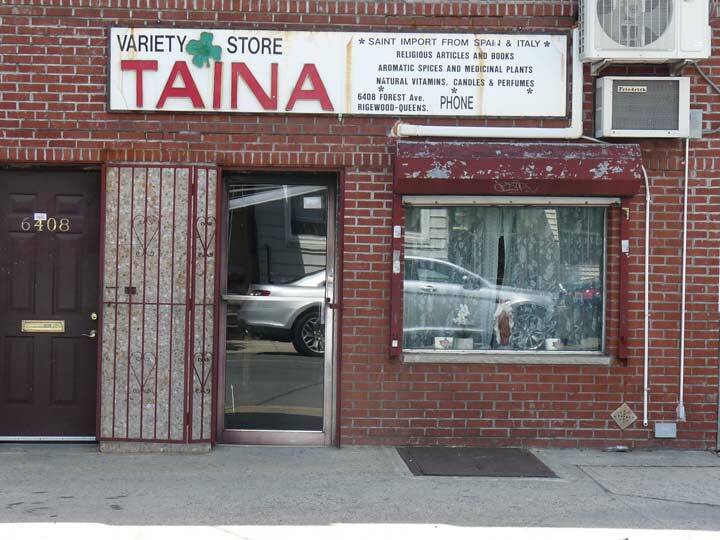 In fact, this Daily News article claims the shop, founded in 1945, was closing in 2007, a good ten years ago! Has it been shut that long? 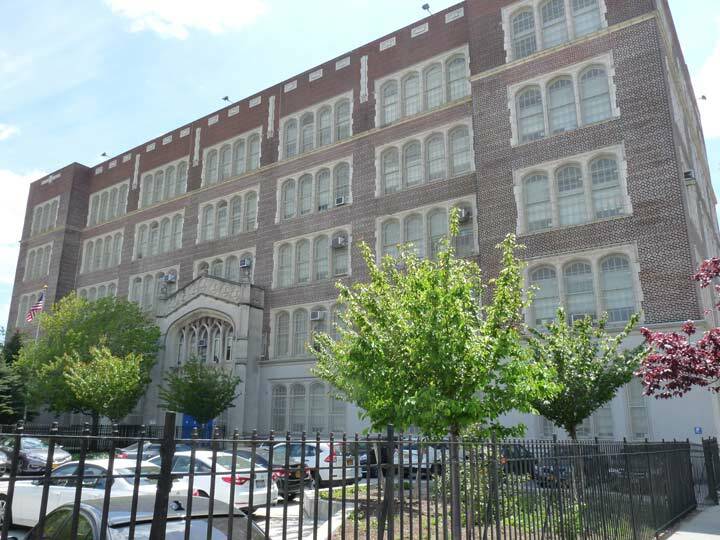 The massive Intermediate (formerly Public) School 93, at Forest Avenue and Woodbine Street. Could be a C.B.J. Snyder design, but the internet is tight lipped about its history (as with most public schools). 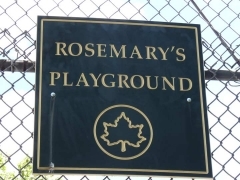 Rosemary’s Playground, or Field of Rosemary, Woodbine Street at Fairview Avenue. The park was named for attorney Rosemary Gunning (1905-1997) who as a Conservative became the first woman to be elected to the New York State Assembly from Queens, serving two four-year terms from 1969-1977. Forest Avenue station at Putnam, Fairview and Forest Avenues. 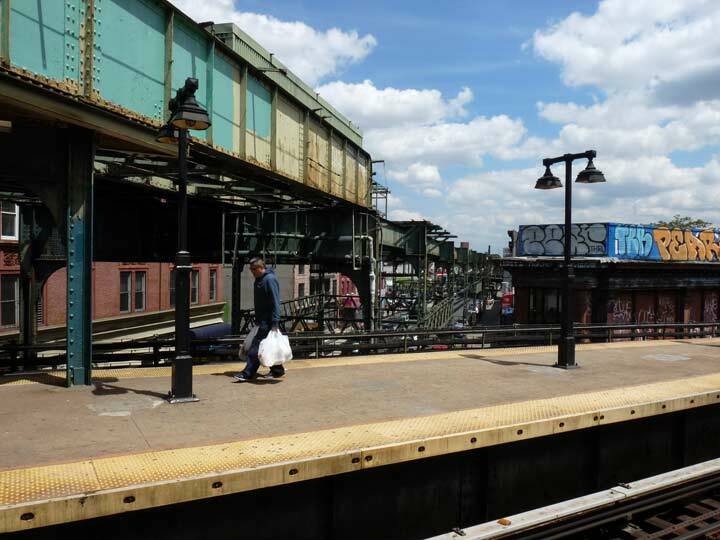 This station opened in 1915, with the Ridgewood Line replacing an at-grade steam railroad. 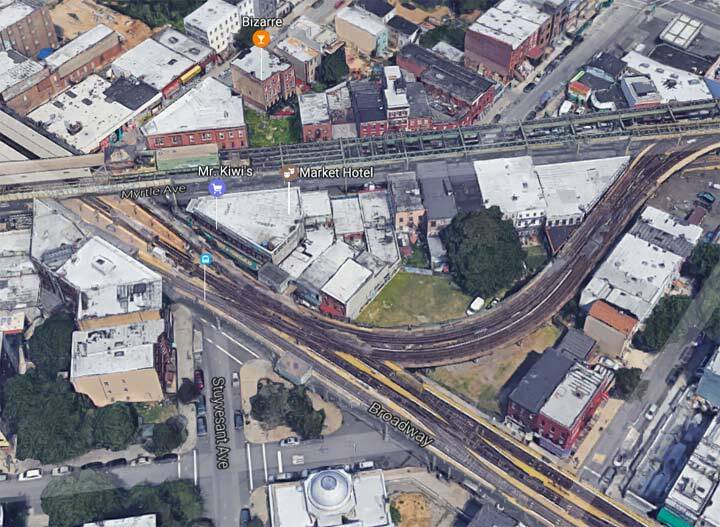 The stretch was elevated, replacing grade crossings, as part of the Dual Contacts purchase that helped build many outer-borough els. A look from the Putnam Avenue side in 1916, when the el was brand new. Note that the avenue is yet unpaved. 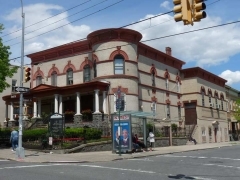 Vincent Seyfried collection, Greater Astoria Historical Society. 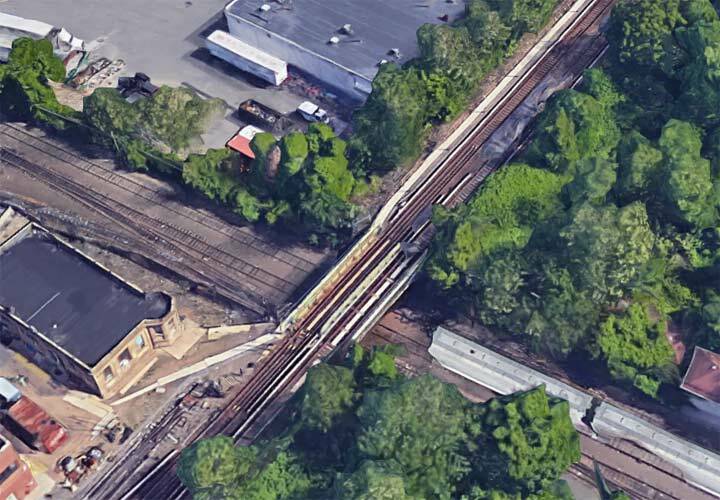 Unusually for New York City (though not Chicag0) the Ridgewood Line has its very own right of way between Palmetto Street and Fresh Pond Road, under which ran a couple of trolley lines until the 1940s. 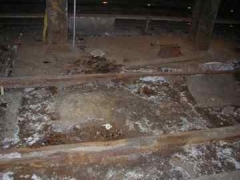 The tracks are still visible in spots. 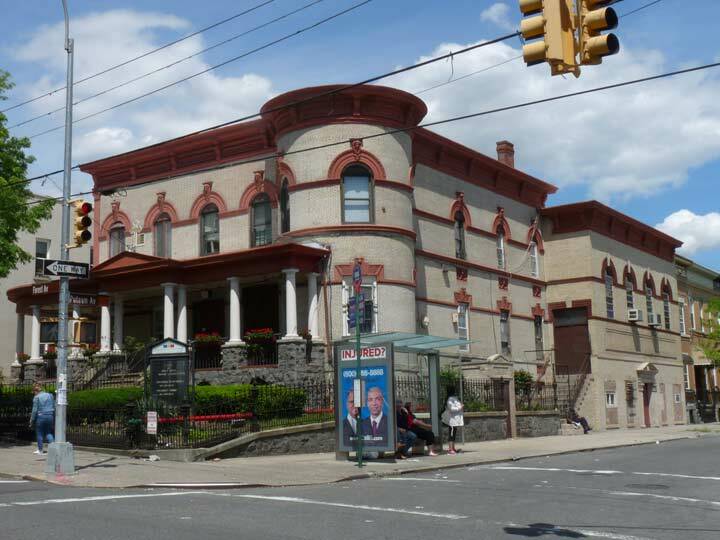 The Meyerrose House was built on Forest and Putnam Avenues in 1906 by the Sheriff of Queens County, Joseph Meyerrose (1859-1940). 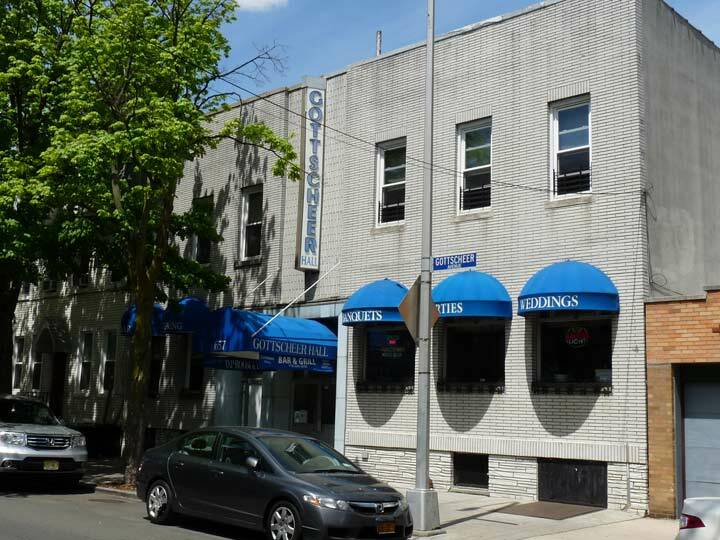 It subsequently served as a political clubhouse, a restaurant and a knitting mill. 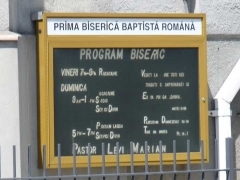 Today it is a Romanian church. His family had owned a farm off Woodward Avenue where the Mathews Model Flats were built. He later moved to Richmond Hill. 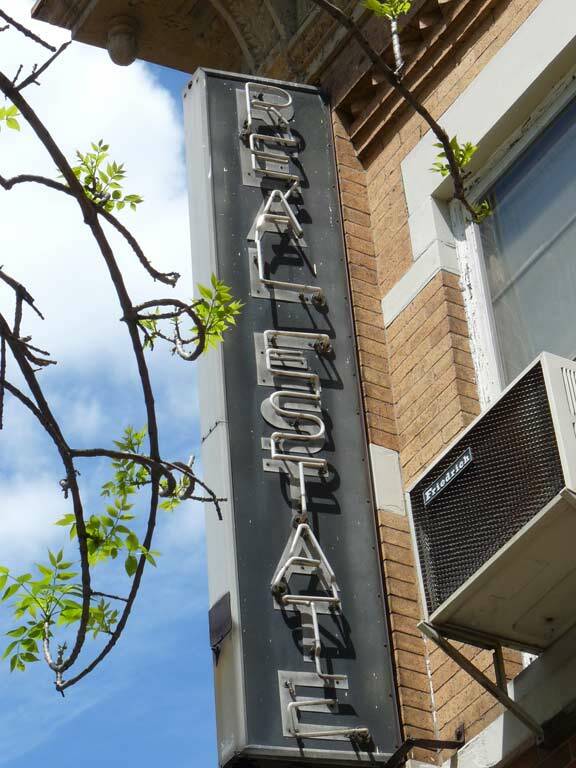 … and a neon vertical REAL ESTATE sign. 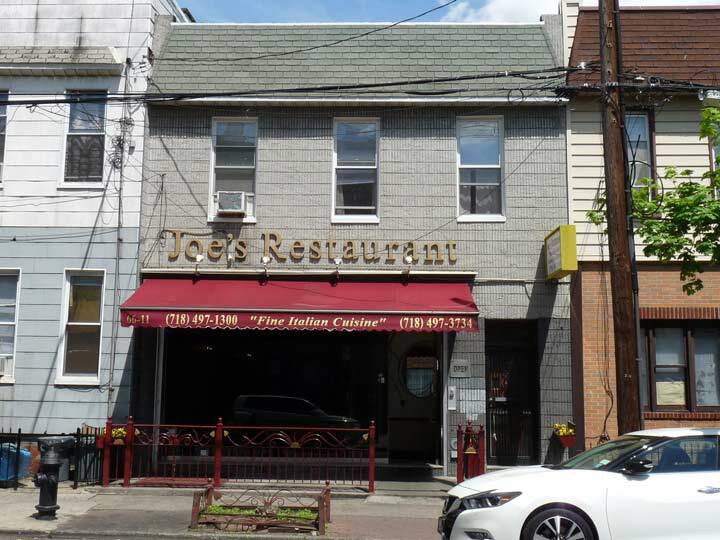 Joe’s Restaurant, 66-53 Forest, seems pretty old school — a checkered sign imitating the tablecloths and curtains in the window. 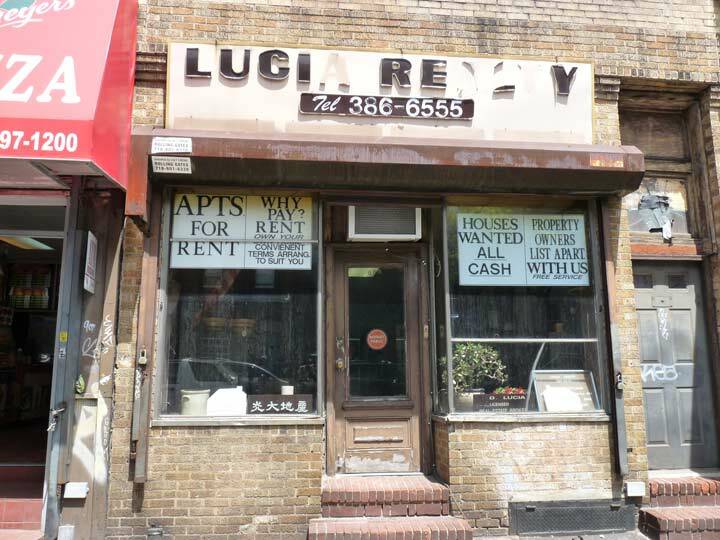 This, however, is the former location: the restaurant has moved a couple blocks north to 66-11 Forest. 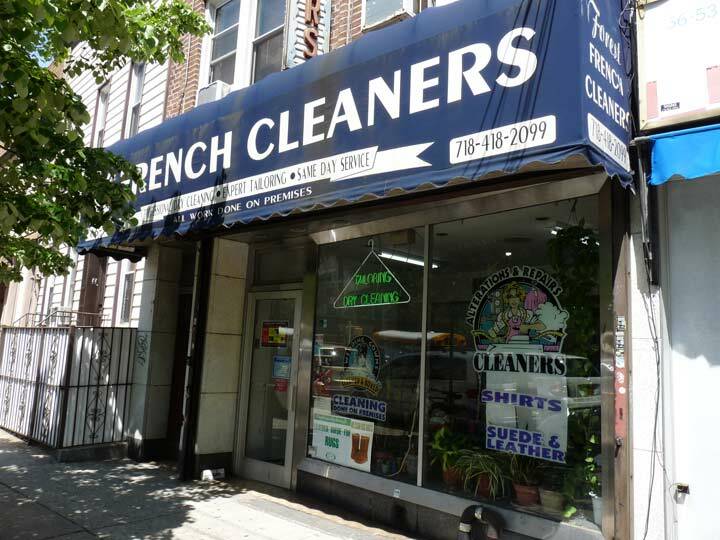 At 66-51 is one of the hundreds of “French” cleaners around town. The owners of these places are not from gay Paree. 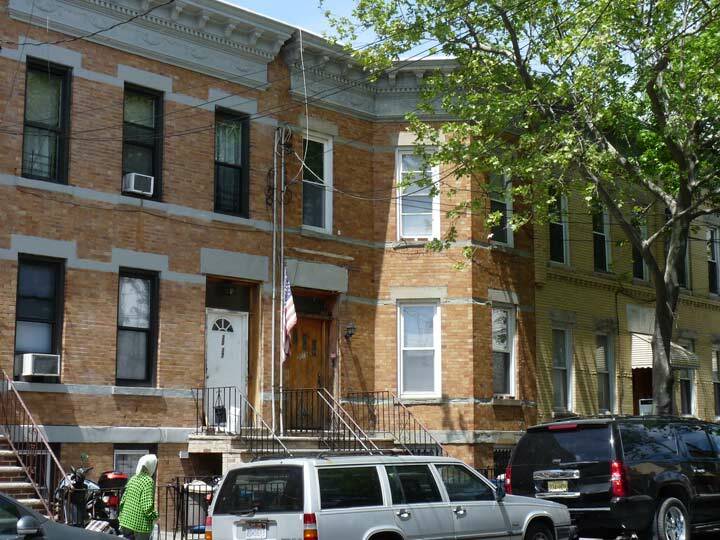 There are, undoubtedly, a lot of houses in Ridgewood like 66-45 Forest, off of Woodbine. 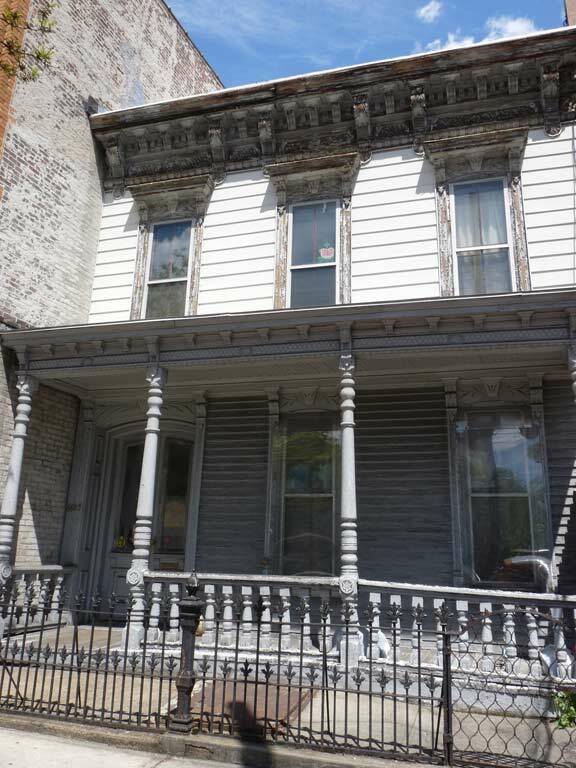 However, you can’t tell because their fine Italianate detailing is covered by aluminum siding. Woodframe houses like this have, in fact, been outlawed for many years because of fire regulations, but I’m glad the owners over the years haven’t seen fit to insulate it. 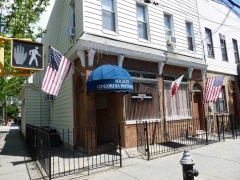 At Forest and Palmetto, a name that sounds Italian, an american flag waving over the sidewalk marks am Italian social club, Societa Concordia Partanna, named for a town in Sicily. The west side of Forest Avenue between Palmetto and Woodbine is dominated by these G.X. Mathews 3-story attached residences featuring buff Kreischer brick. Notice the rounded corner at Palmetto and the angled bays on the Forest Avenue side you could cut your finger on. I can’t vouch for the interiors but the exteriors of these buildings are among the finest residential architecture ever conceived. 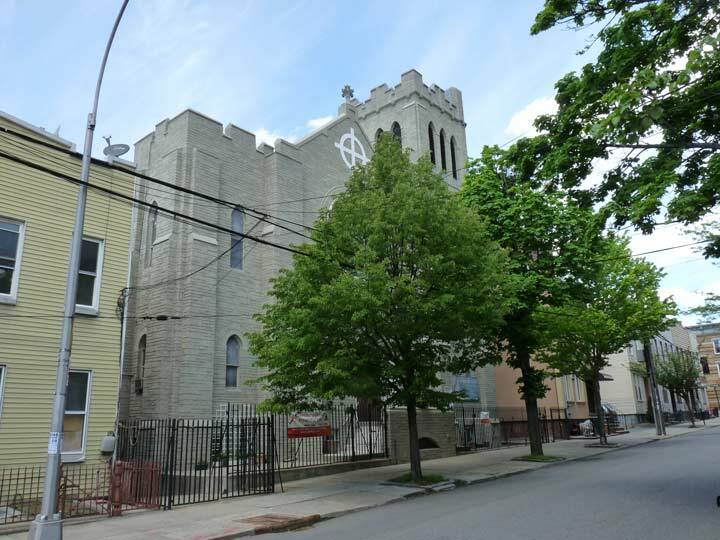 The NYC Landmarks Preservation Commission wisely created a protected district on these blocks. 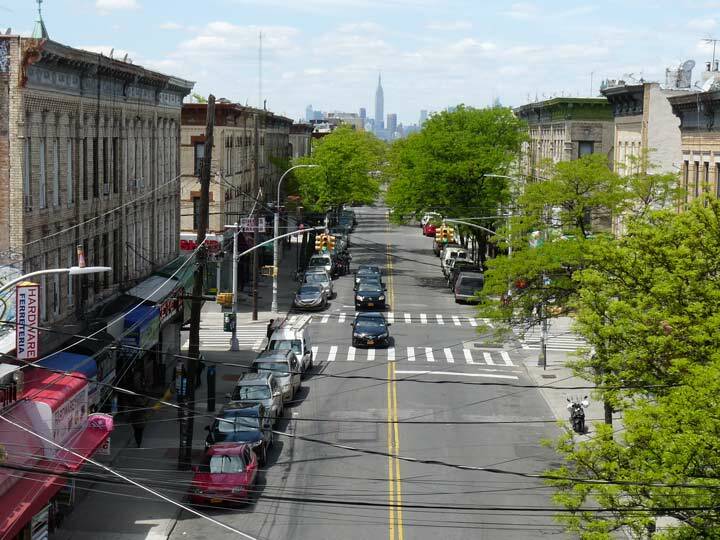 Forest Avenue is something of a dividing line in Ridgewood separating the Bushwick street grid pattern, angled NW to SE, from Ridgewood’s, which is more east-west. 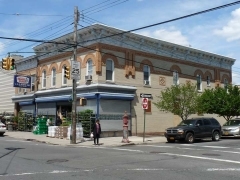 Hence, two of Ridgewood’s avenues, Fairview and Grandview, end at Forest Avenue at angles, which makes for interesting architecture. The traffic triangle at Forest and Grandview is small, but enough to fit a Korean War monument installed in 1955; the triangle is well-marked as Korean Square. This G.X. 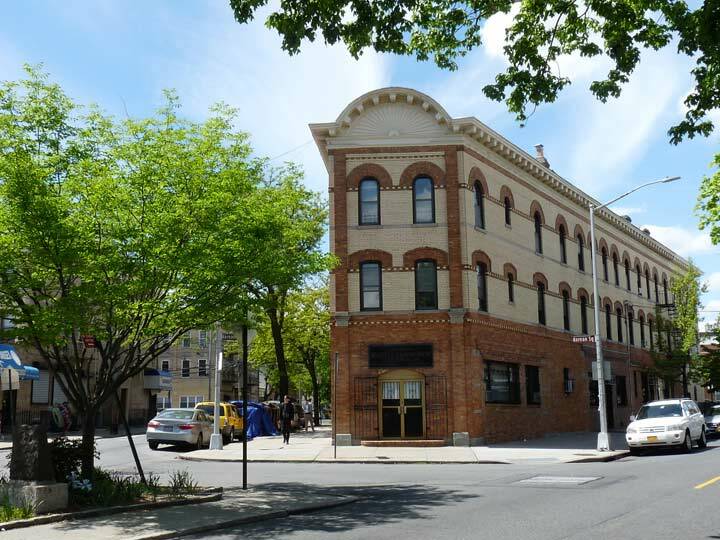 Mathews version of the Flatiron Building is home to the law firm Masiello and Kordisch. 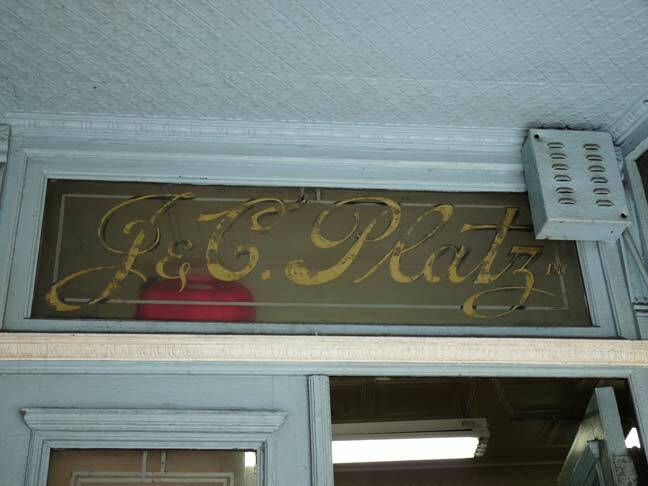 Platz Hardware, housed in one of Ridgewood’s fine old brick buildings, still has some gold-leaf lettering on the doorway. 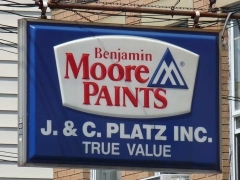 The Platz Brothers started selling painting supplies in 1909 from the smaller building on the left, and in 1913 built the corner structure so they could expand their business to include hardware. 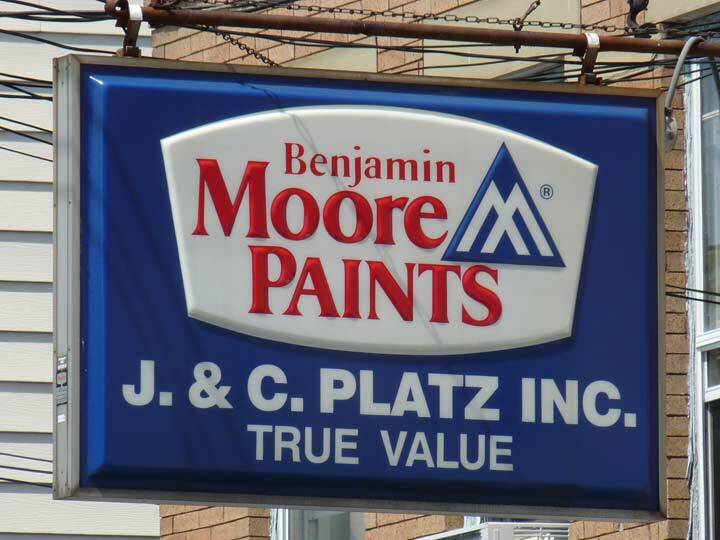 After over 100 years, Platz Hardware is still in business. They remain at the same location, and now they also sometimes sell flowers. In 1909, they advertised on the side of a horse-drawn cart. Today they reach the masses via their website. 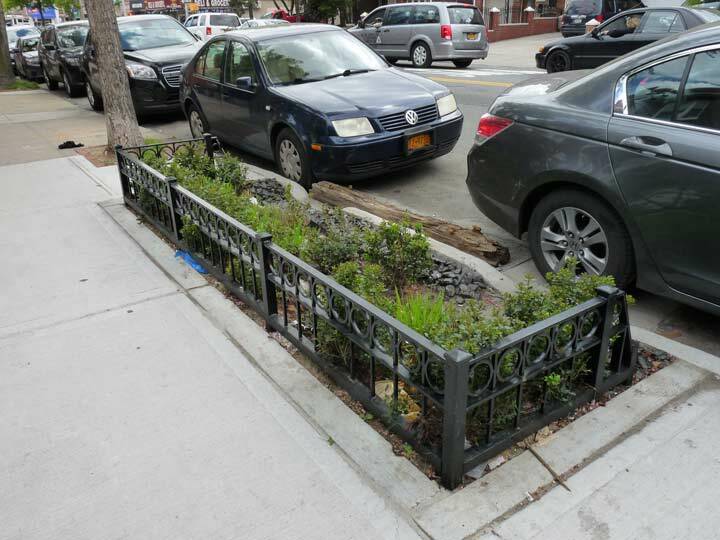 The city has begun installing curbside bioswales in Ridgewood and other areas relatively close to Newtown creek. These are landscape elements designed to concentrate or remove silt and pollution from surface runoff water. 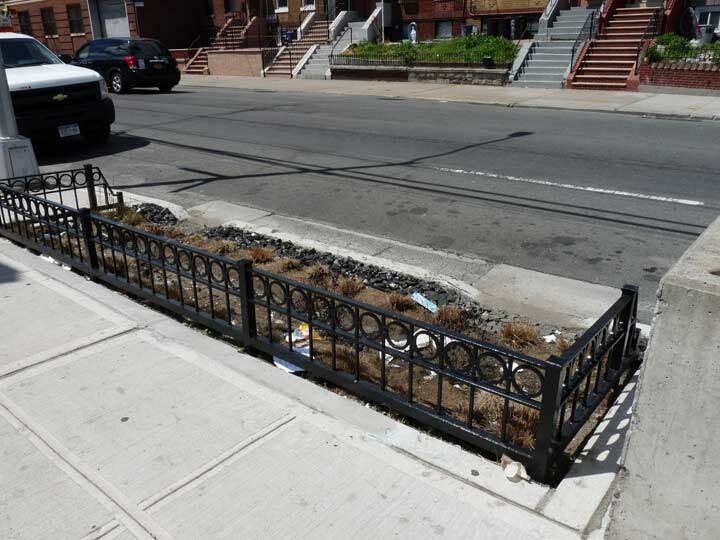 They consist of a swaled (moist) drainage course with gently sloped sides (less than 6%) and filled with vegetation, compost and/or riprap. It’s up to the locals to decide whether these will become garbage receptacles, places for Fido to deposit dinner, or cultivate them. Forest Avenue and Linden Street. 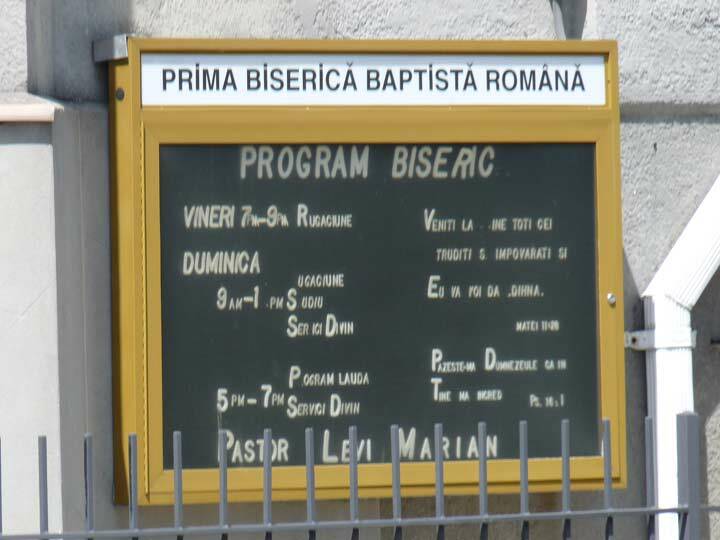 The gray stone clad Prima Biserică Baptista Română, or First Romanian Baptist Church, features one of the few signs I have seen in town written in Romanian. 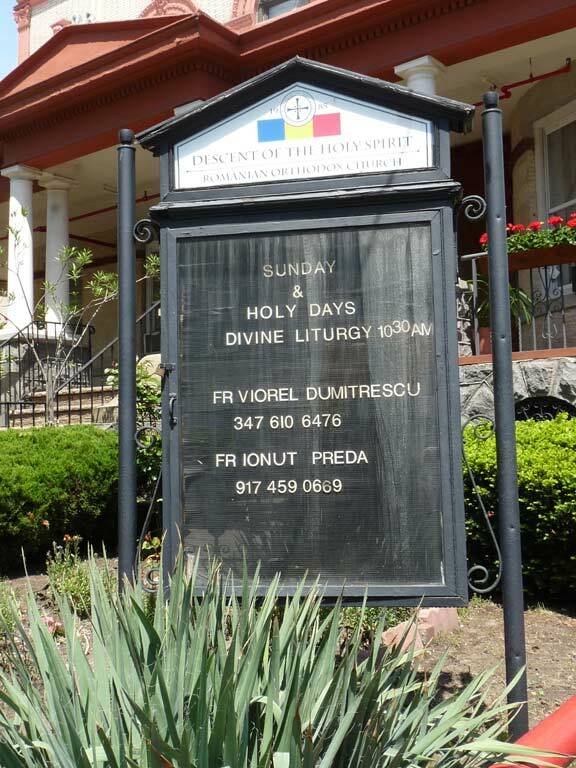 Ridgewood features immigrants from not only Poland, but other Easter European lands such as Romania and Slovenia. 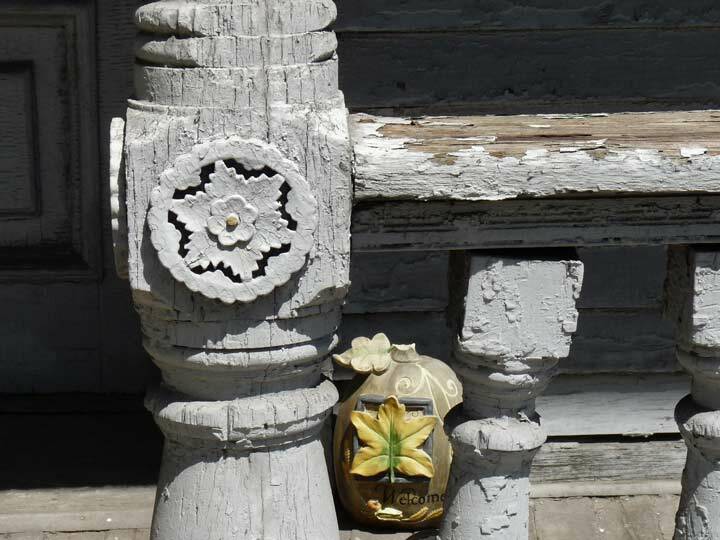 Arlo Guthrie said you can get anything you want at Alice’s Restaurant but if it’s not lunch you’re interested in, nip over to Tania at 64-08 Forest for aromatic spices, medicinal plants, religious books, vitamins, candles and perfumes. A fella could have a pretty good weekend in Vegas! 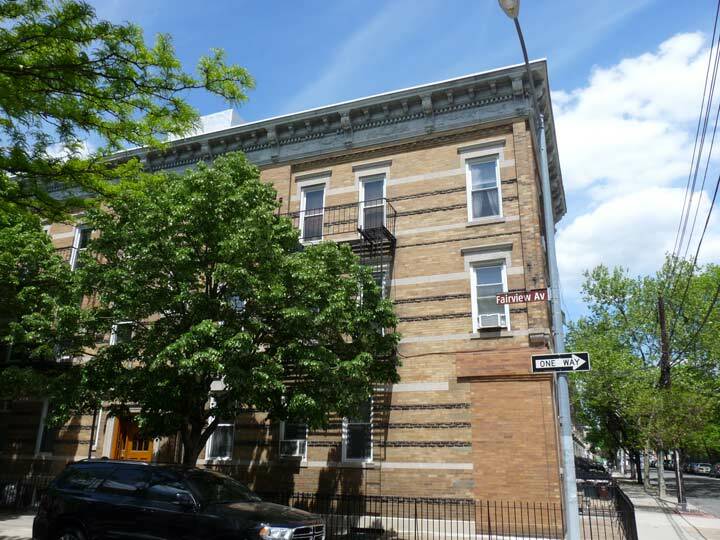 With its chamfered corner and dormer windows, this house at Forest and Bleecker Street looks as if it could have been a bigger deal at one time –I’d like to see a photo of it before the Fab 50s. 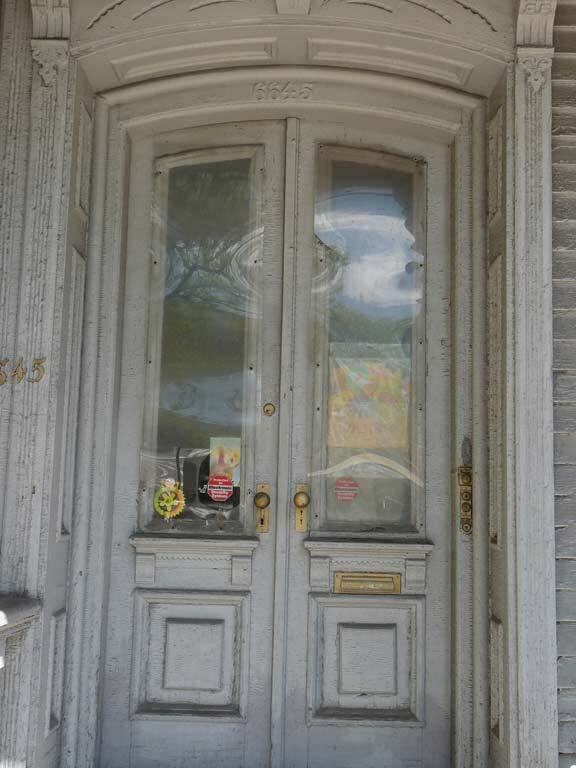 Moving north a bit, I hadn’t noticed this tiny plumber’s office on Metropolitan west of Fresh Pond Road (the office, not the plumber, whose height is unknown to me). It has some interesting scale models in the window. 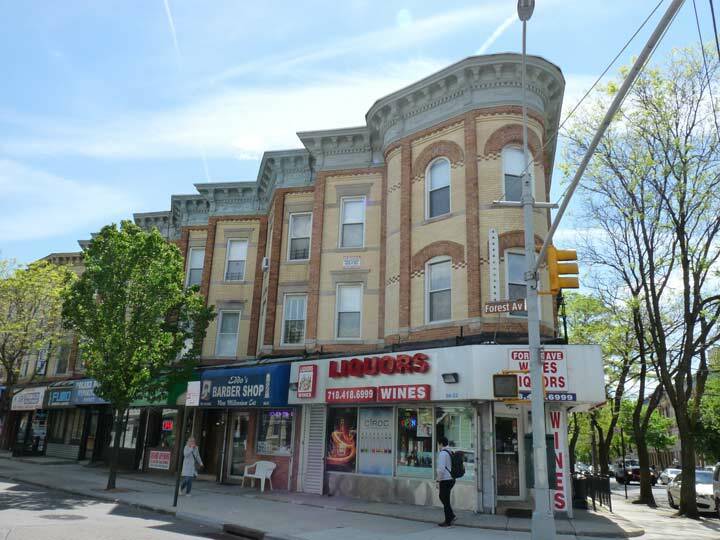 Going north on Fresh Pond Road, it seemingly splits in two at 59th Drive. I’m a scholar of street patterns, so I suspected that something historical is up. My suspicions, as usual, were correct. 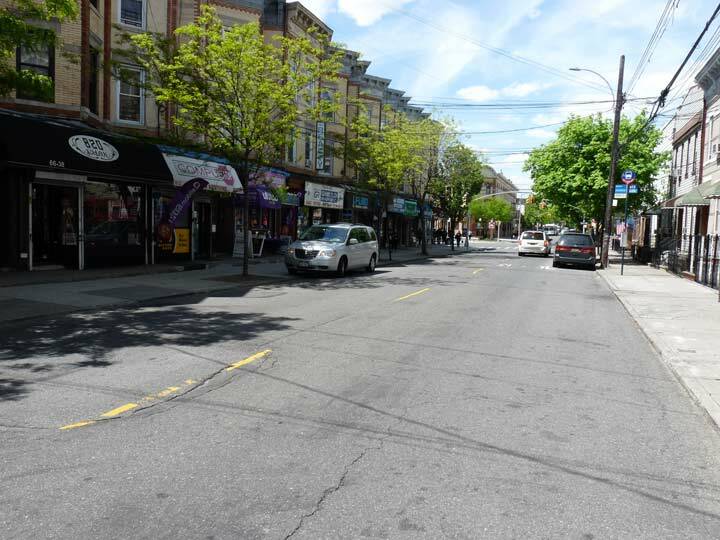 The road on the left is the original Fresh Pond Road, now 61st Street. 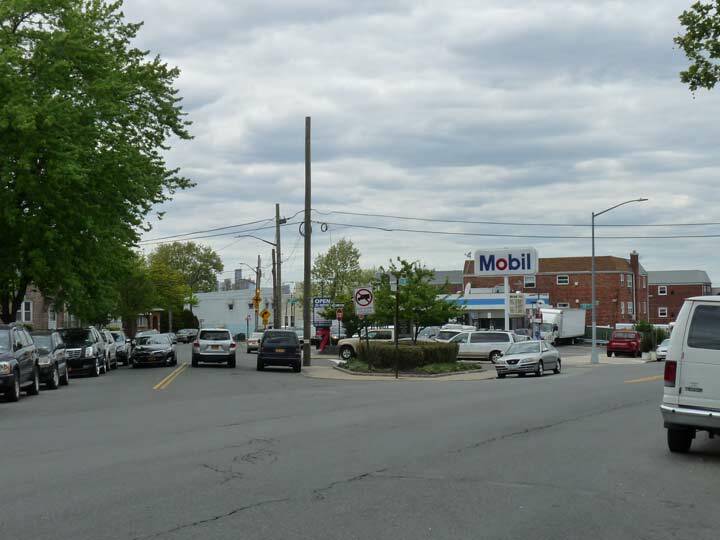 The road on the right is the current Fresh Pond Road which ends at Flushing Avenue. 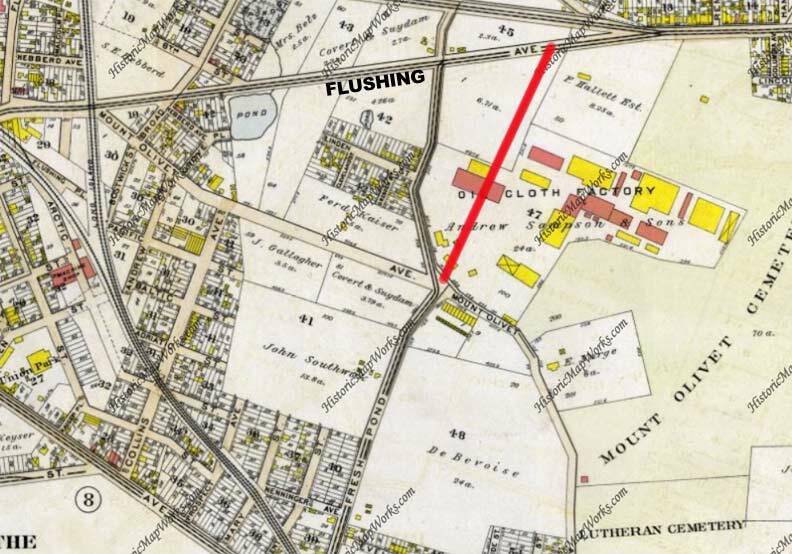 I’ve taken this 1909 map and helpfully drawn in Fresh Pond Road’s present path in red. 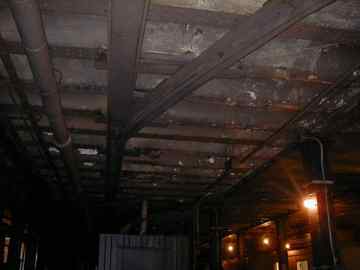 It continues through what was once an oilcloth factory. Before garments were waterproofed with chemicals, oilcloth was used as an affordable alternative to leather. 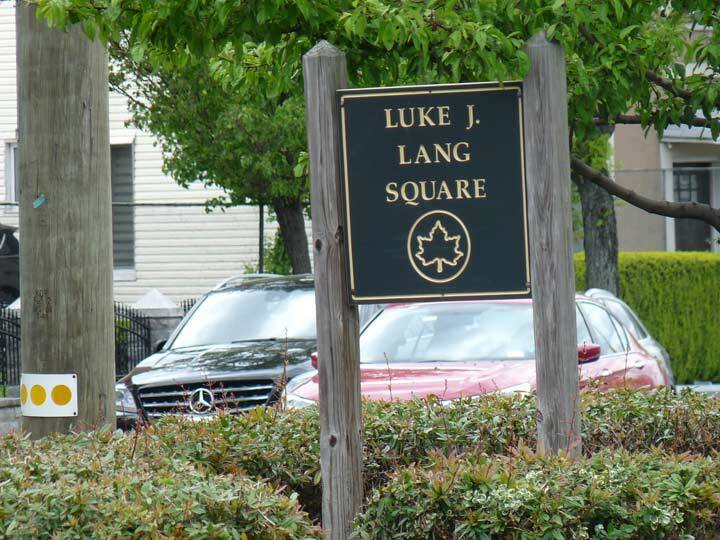 The tiny traffic triangle at Fresh Pond Road and 61st street is Luke J. Lang Square, named for a local resident who dies in World War I. After this I headed up Flushing and Grand Avenues to get the Q18 bus, well-chronicled FNY territory, but I’ll be back in Ridgewood soon, one of my favorite parts of town. 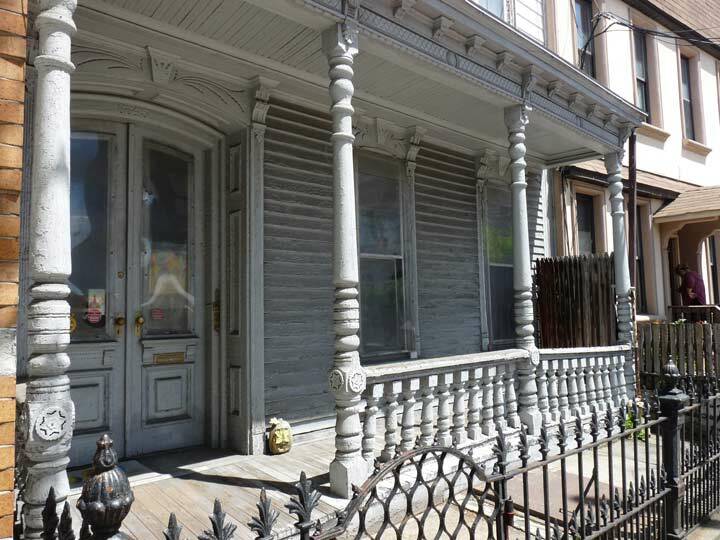 More from Ridgewood in 2005 and in 2013. Funny you included that Plumbing (Roofing?) office with the scale models. 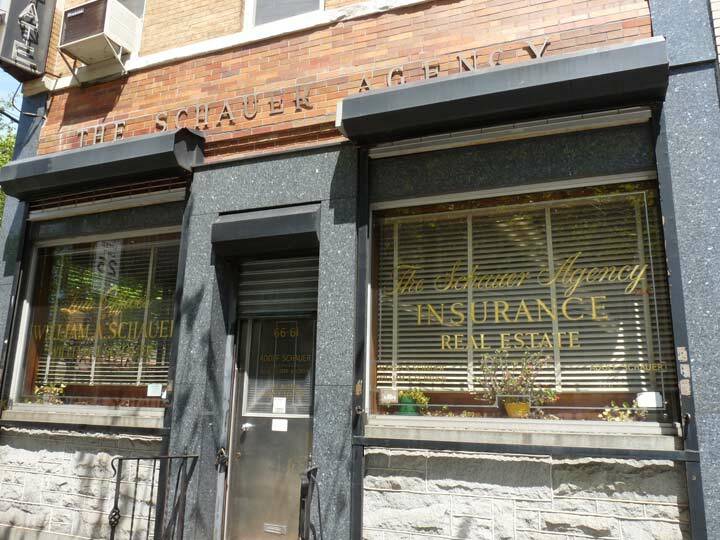 My family moved to 61st Street between Metropolitan and Bleecker, about a block away from that storefront, in 1986 when i was 4 years old. I tell you the place has never been open once or changed in the slightest from my earliest memories. 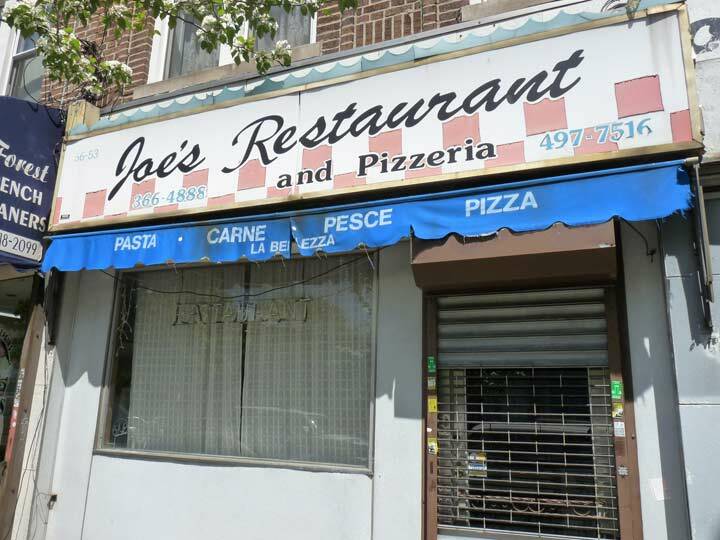 I used to eat at Joe’s with my partner Benny Nuzzo years ago at the old location. I remember the M line as it is called going down to downtown Brooklyn on the el with open cars and strawlike seats. They ran these in late June I believe and ran into them in Brighton beach. 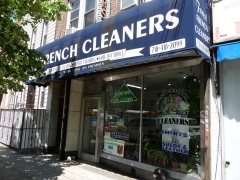 Brought back lots of memories.Had an office on Fresh Pond Road down from the Bus terminal.It was a great area and still have a client on Fresh Pond Road and get their once in a while. 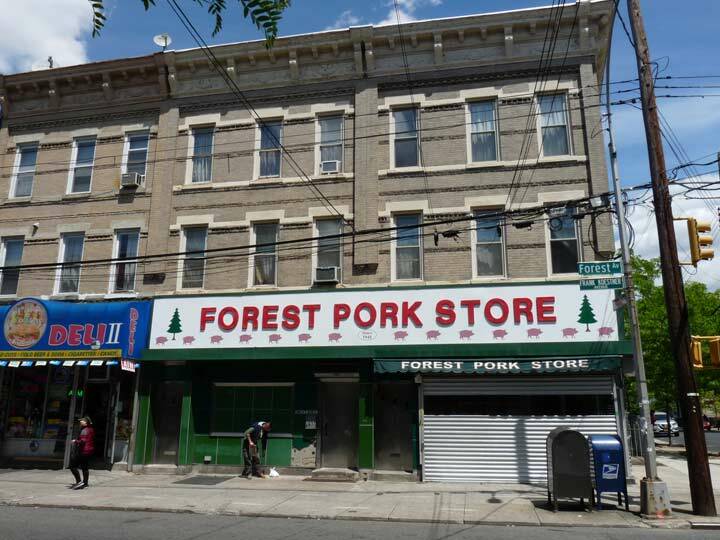 The Huntington outpost of the Forest Pork Store is still in business. 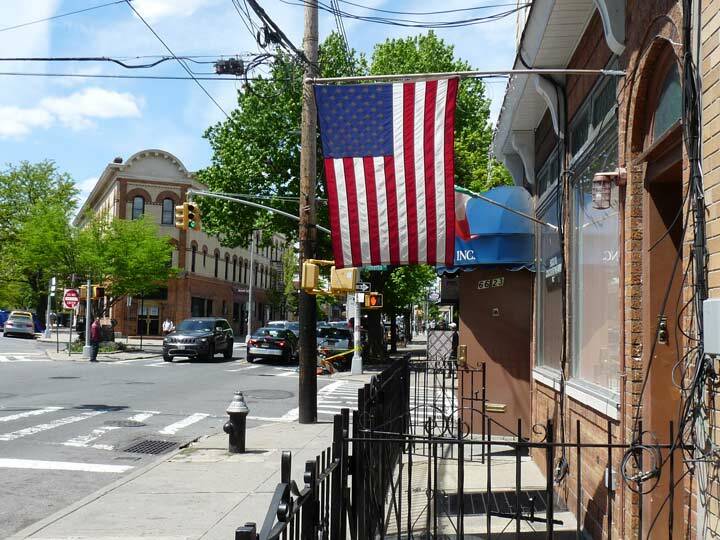 Ridgewood started to change from mainly German to other nationalities over the years. My sister moved into the 4 family home next to the Dry Cleaners on Forest Ave, so the Forest Pork store was only steps away and we would always go there to buy meats, cold cuts, some of the best canned sauerkraut made with white wi e that I’ve ever tasted and great homemade salads, etc. After they first closed, you could place an order for pick up and they weren’t open every day. They still used the back of the store and possibly still do for smoking. I know about the store in Huntington but won’t travel that far for those products. Lovely tour for a lovely Spring day. Many thanks! The difference between a solid double yellow line and a broken or dashed single yellow line is that you can legally pass another vehicle across a single yellow dashed line but you can not do so across a solid double yellow line. Excellent article! 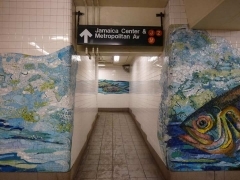 I’m quite familiar with the J line, as I used to live in Kew Gardens Hills and work in downtown Manhattan, so I would ride the J from Sutphin Boulevard to the end of the line at Broad Street. It was the only one-seat ride from my neighborhood to my office. 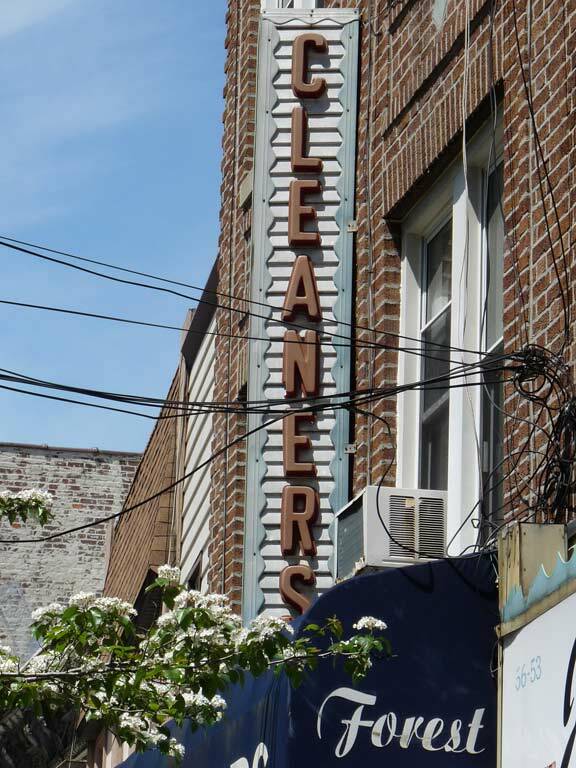 The J is my favorite fan line – it is loaded with history and curios. It is worth noting that prior to the Dual Contracts in 1913, the Essex Street station was the end of the line, and was then called “Delancey Street”. 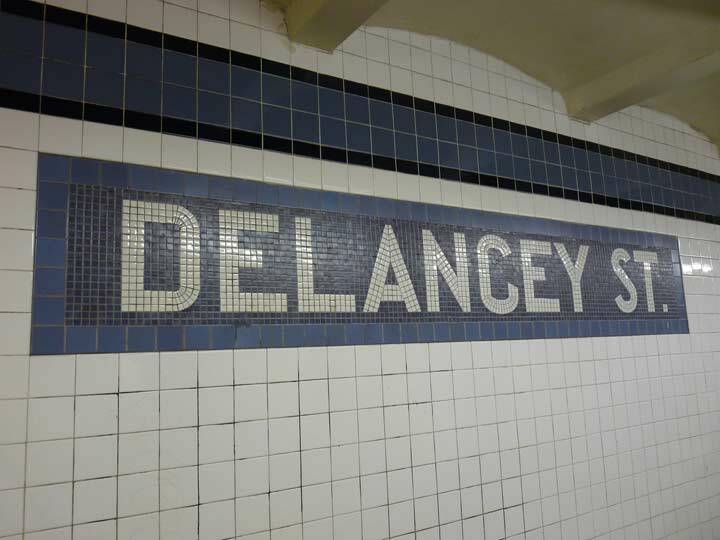 I believe there is a photo floating around the web of the station with the “Delancey Street” name tablets on the walls. The original station as built by the BRT had two side platforms and one island platform, served by two tracks. There was also a connection from the inbound tracks to the trolley station although there is no evidence it was ever used. 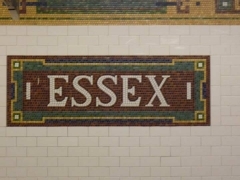 When the Dual Contracts were signed and the line was extended west on Delancey Street past Essex Street, the station name was changed to Essex Street. 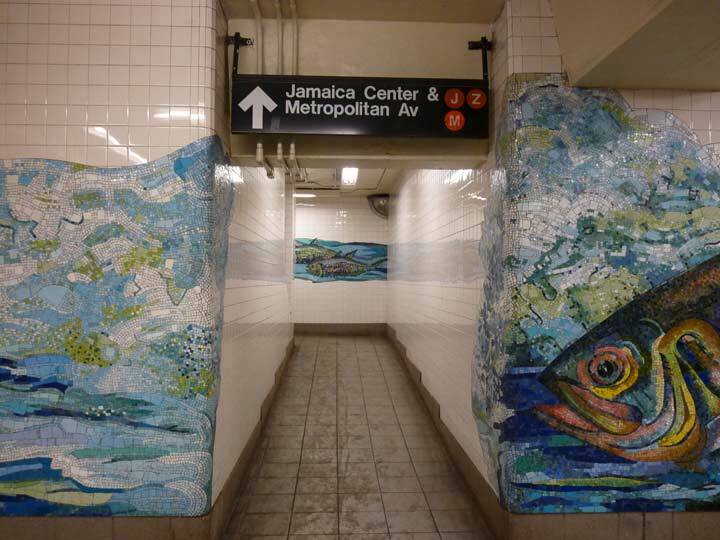 I used to live in Briarwood, Queens and work in downtown Manhattan so I used to ride the J line all the time. 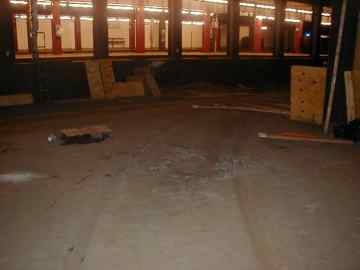 I’d get the train at Sutphin Boulevard when it was still pretty empty so I got a seat. I would ride to the end of the line at Broad Street and walk a few blocks to my office. It was the only one-seat ride available between my home and work. The J is my favorite railfan line. 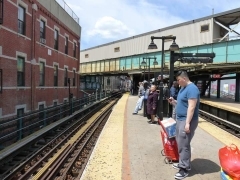 It is loaded with history and curios, such as the Chestnut Street LIRR connection, the dead-end trackways at Cypress Hills and the abandoned Broadway station on the Myrtle Avenue line, just to name a few. 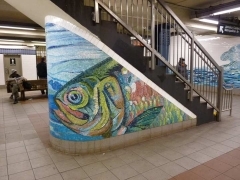 The Essex Street station you mention itself has an interesting history. The station predates the Dual Contracts. 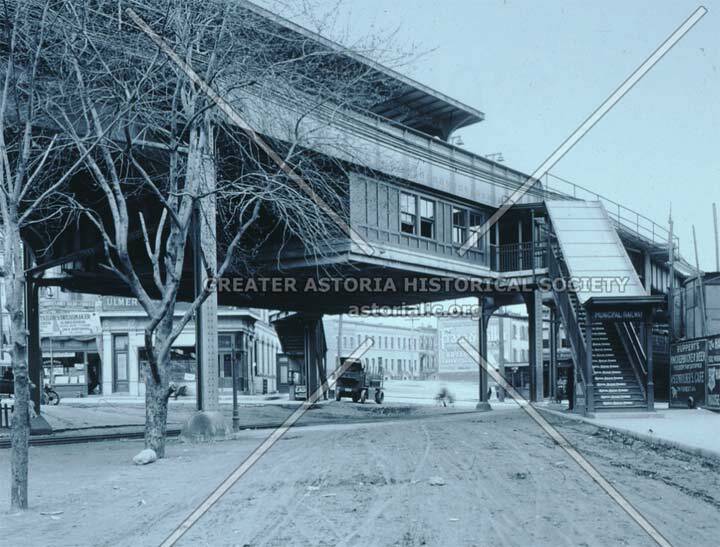 Before 1913, the station was called “Delancey Street” and was a terminal for all BRT Broadway trains. It was a two track station with one island platform and two side platforms. There was also a physical connection between the inbound track from the Williamsburg Bridge and the trolley terminal but there is no evidence it was ever used. When the Dual Contracts were signed, the line was extended westbound past Essex Street to Canal Street and Bowery. 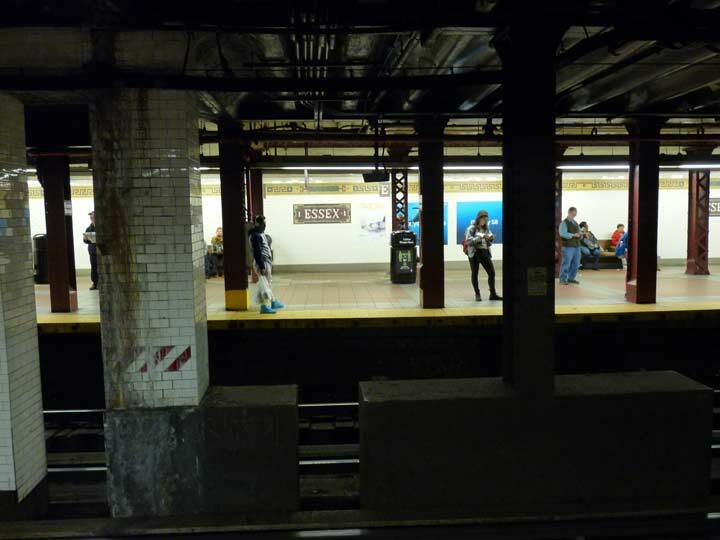 Since all of these stations ran under Delancey Street, the station name was changed to Essex Street. I think I once saw a photo of the station when it was still called Delancey Street. 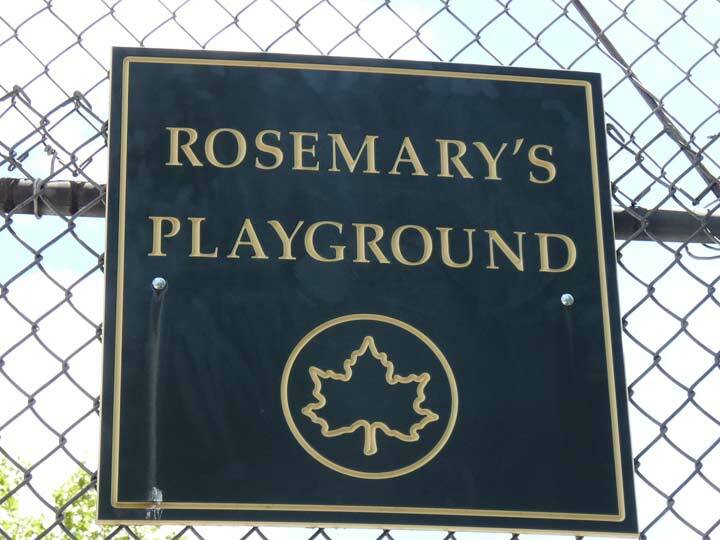 I have many fond memories of days spent frolicking in Rosemary’s Playground. She kept shaking her head & gesturing “no” politely with her hand, but they just kept at it. 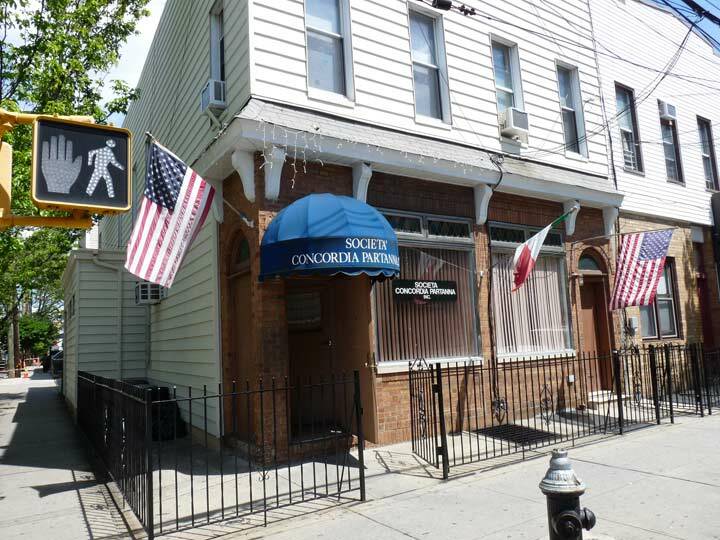 Joe’s Restaurant – when I am in the mood for a straightforward dish of Spaghetti and Meatballs, there’s where I go. 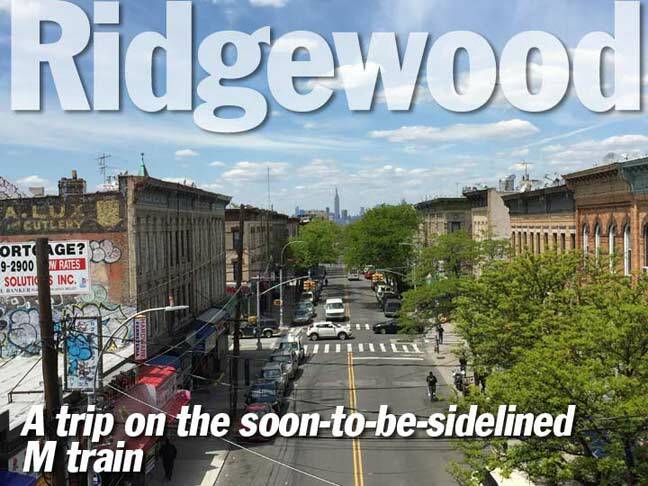 Loved your article on Ridgewood. I’m a native of Ridgewood. Lived there for 50 years. Bleecker and fresh pond road. 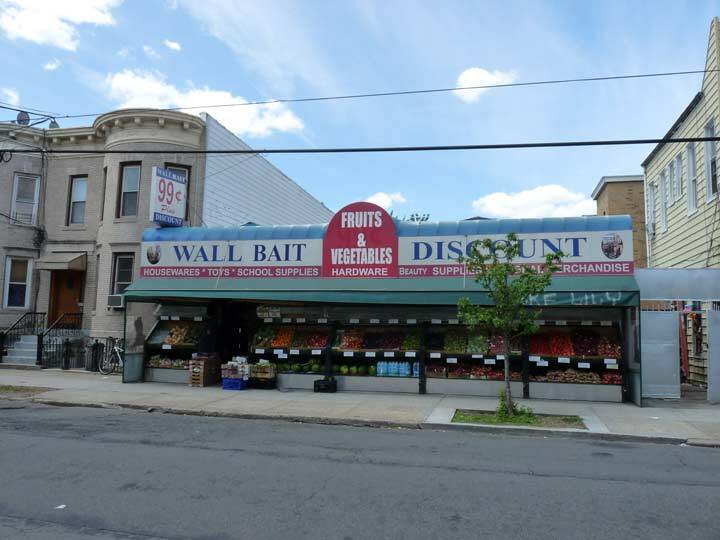 Have you ever done and article on Fresh Pond Road. From the start to finish. That would be an interesting article. 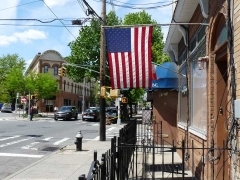 Thank you for all the wonderful information and photos of my hometown, Ridgewood. 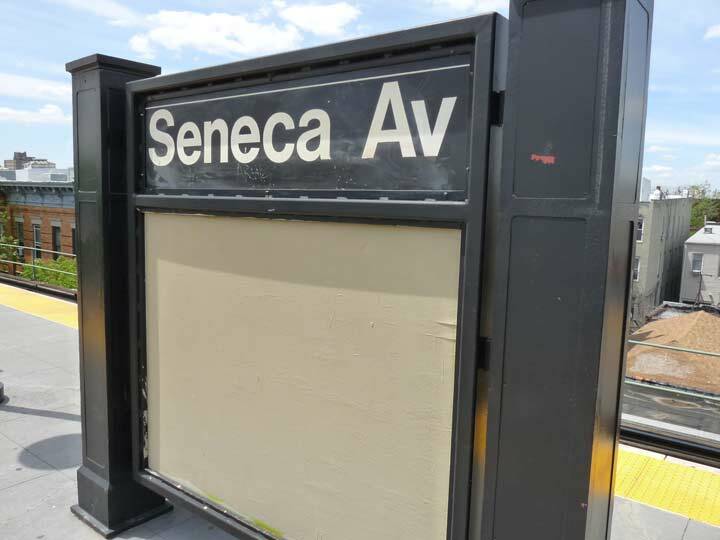 I grew up on Seneca and Stanhope, and I’ve never seen anyone post anything about that area, Seneca from DeKalb Ave, where the carbarnes were, to Bleecker St. Maybe on your next trip? Thank you so much for the journey into my past!